Up and at ‘em! 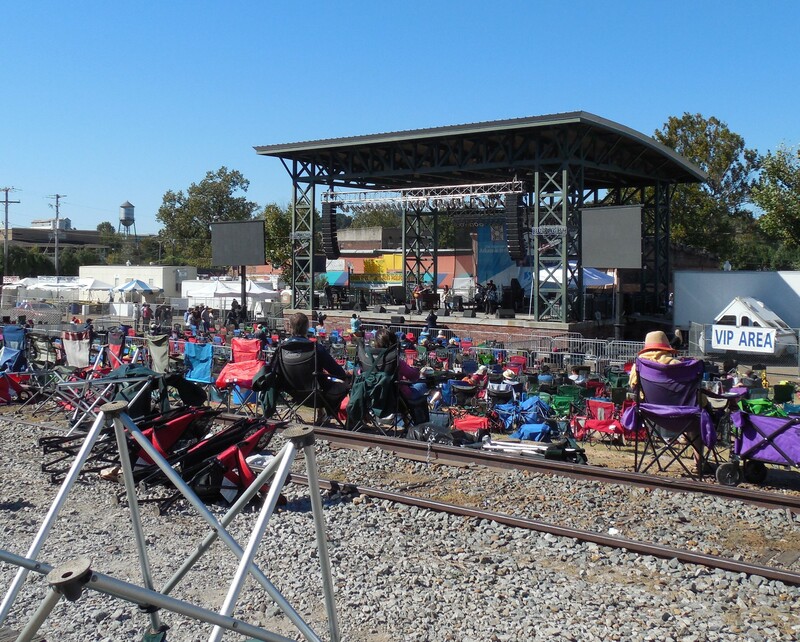 It’s Day 2 for King Biscuit Blues Fest in Helena, Arkansas! To save some time, we decided to stop by Mickey D’s for breakfast. We just need something to tide us over until we can get some lunch. The place was busy with all kinds of folks. There were the older gentlemen in their suits who looked as though they had just come from church. They were very snazzy looking. I swear one of them had on a zoot suit. They even had their fedora with them. There were kids and families in the play area. I looked in to check out the nice big area they had to run around in. I noticed a table with a display shining on it for a board game. How cool was that. The group of kids around the table were having a great time playing. After finishing up, we headed down the road to Helena. This time, we went in the front way and not along the side road on the river. At the bridge going up, my stomach did a couple of little flips. I really have a hard time with heights. Traffic was light as we got into town and turned to head toward the center of the old side of town and the levee. 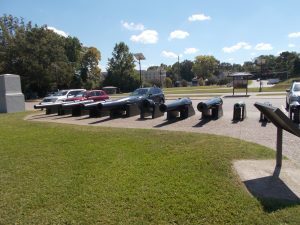 The young ladies were in place to rent out their parking lot. We pulled in and paid our $5 to park in the best spot in town. We immediately loaded up the wagon and remembered to bring out jackets this time. The daytime temperature was supposed to be sunny and 79 with a light breeze off the river. Tonight’s temperatures would promise to be even chiller than the previous night. It was to be around 58 after the sun went down. It was a little warm for long pants, but too cool tonight for anything but that. We decided to go to the left side of the stage and set up today. 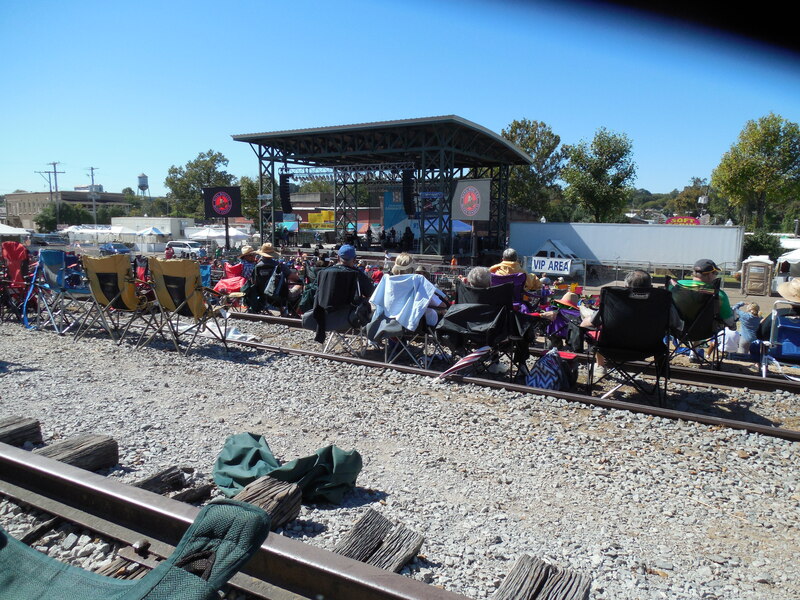 We found a spot on the tracks that was not too far off center and afforded a great view of the performers. After getting set up, we went down to the town to see what was going on. It was just after 11:00 in the morning and the symposium had started in the Malco Theater. 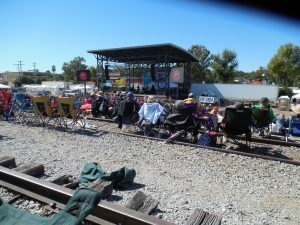 The first hour, Roger Stolle from Cat Head Music was leading a panel with some of the current Bluesmen out of Clarksdale. Unfortunately, Red Paden would not be attending. Red is the local philosopher in town. He is not to be missed, if you ever get a chance to hang out. Sean “Bad” Apple, Mark “Muleman” Massey, Hezekiah Early and Robert “Lil Poochie” Watson were the members on the panel. 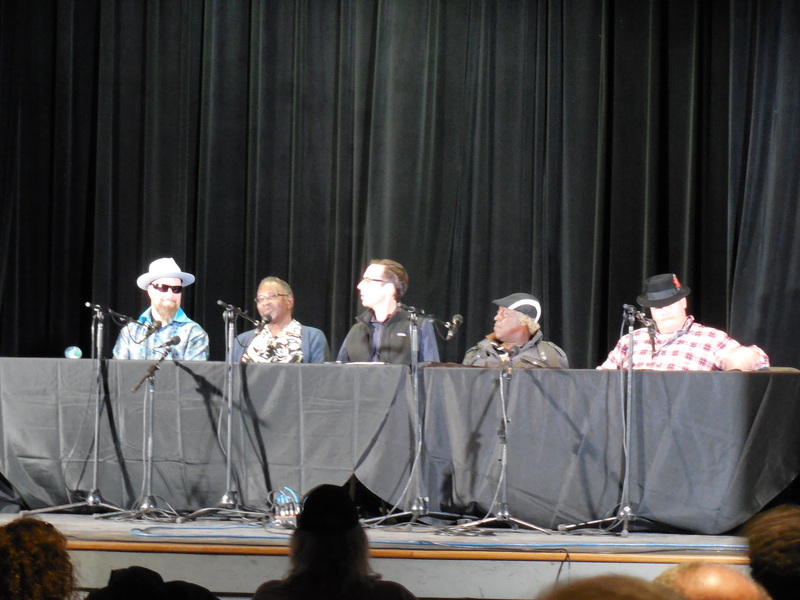 Roger was having the panel describe how they each got into the blues and became musicians in the Delta. Sean was the only member not born in the area. Their stories were interesting and varied. Roger had Lil Poochie describe his meeting Sir Paul McCartney. Apparently, Paul was a fan and had someone go to Mississippi to get Lil Poochie and bring him to LA for a meeting and to record. How great is that! After the panel discussion, we wondered up the street and back down again. Just as we went by the theater, Hezekiah and Lil Poochie were coming out. I went over to tell them how much I loved hearing their stories and that was the great thing for me. They appreciated that we even cared to hear them and thanked us. No, thank you guys for being willing to share your time with us. We promised to come by and hear them playing at one of the side stages this afternoon. 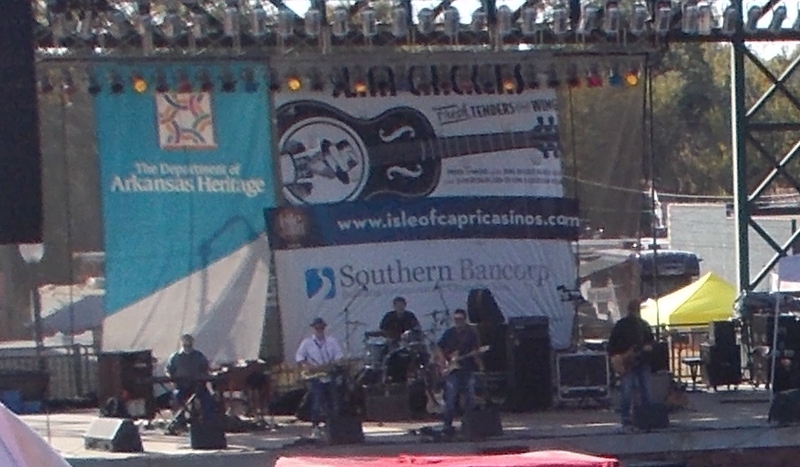 Back at the main stage, we settled in to listen to the Peterson Brothers on stage. These brothers are 17 and 19. We heard them at the Chicago Blues Fest about 5 years ago. They were awesome then and have only grown in style. For someone so young, they are quite the masters of sound and style. They had a couple of percussionists on stage with them. The four of them were putting on quite the show and we had a great time watching them. After their set, we headed down to check out the food selections for lunch. We decided on our picks and went by Bubba’s to purchase a new Peterson Brothers’ CD and get it signed. While we waited in line, we got to watch the boys. They are shy, but seem to like the attention. Rich stepped up and got signatures from all of the guys. He explained we had been watching them for a while now and hoped to continue to see them out and about. One the way out the door, we stopped to talk to their folks. They are really nice. Now it was time for that food. I got loaded frito pie and Rich got crawfish etouffee. 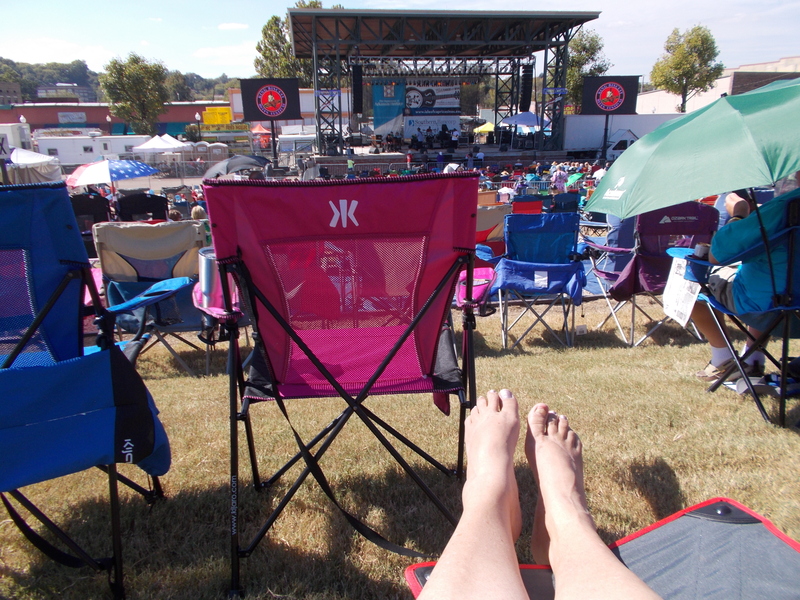 Back at our chairs with a couple of beers, we listened to Kathy Guillen and the Girls. It never fails to impress me how this festival finds new talent to bring to this stage. 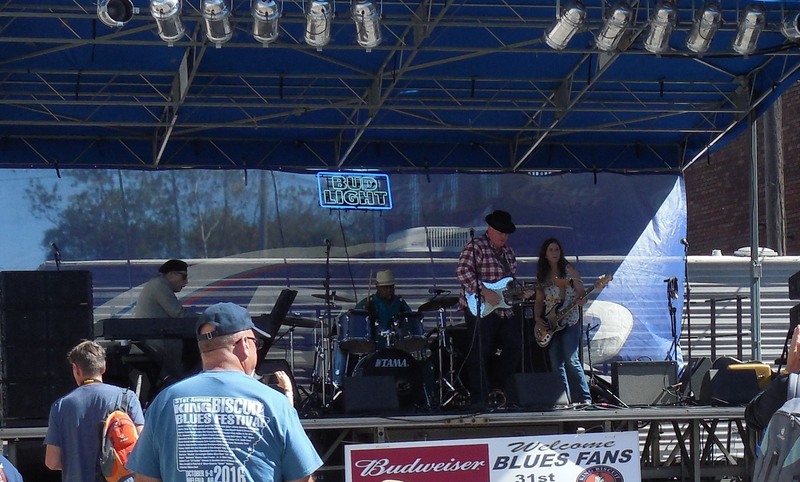 These girls had the licks and delivered the blues. I was impressed. Bob Margolin, Bob Stroger, and Kenny Smith were on stage next. Bob Stroger was one of the best bassist in Blues back in the day. Bob Margolin had played with Muddy Waters. 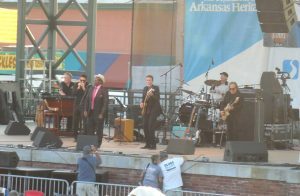 Kenny Smith grew up in the blues as his father, Willie Smith, was a bluesman and a pal of Muddy Waters. They talked about blues and played songs from different eras in blues. It was a fun show to listen and learn from. Then a real treat came on stage. The program said Kevin Naquin. Who the heck was this? Never heard this name before. 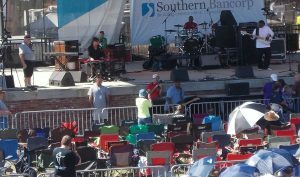 It takes about 15 to 20 minutes for the crew to set up the stage and run the sound checks. In this time, we got to check out the people milling around the stage. 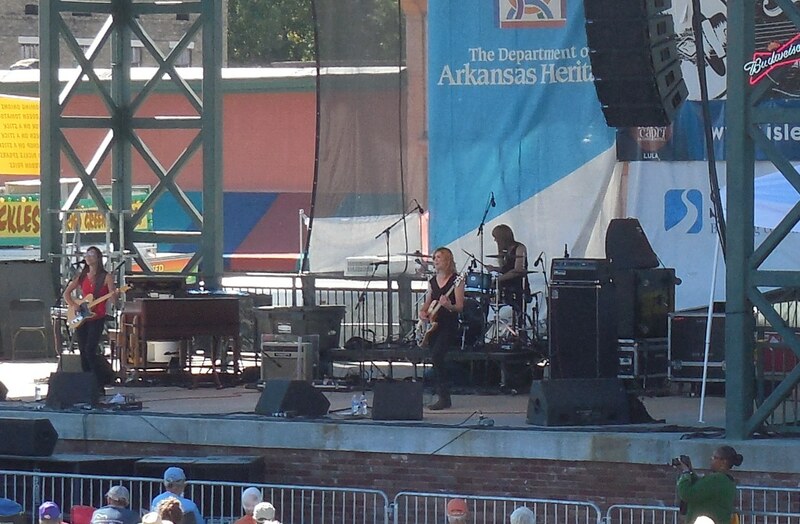 There was a drummer, bassist, guitarist, and keyboard player. Then there was some other guy messing with different accordions. This could be interesting. Sure enough, it was. 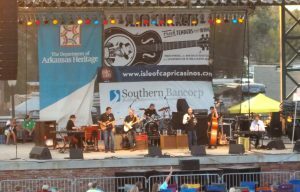 Kevin Naquin and the Ossun Playboys was a Cajun band that can swing and party. We had a great time. After the set, Rich went down to buy a CD. While he was there, he talked to Kevin about Cajun and Lafayette area, where the band was from. Rich came back with a CD and some stories. Kevin says to look them up if we are ever in the area again. We will definitely do that. I’d love to see them in their own environment and experience one of the Cajun clubs there. While we were listening to the music, our neighbor came back to his chair. This guy was from Memphis, TN and down here on his own to listen to the blues. This was his 19 consecutive year in attendance. He brought his camper down and stayed at the Helena campground. They provided a shuttle service back and forth. I had a feeling he was going to need that by the end of the night. Our neighbor (never did get his name) recommended that we get tamales from Pasquale’s on the main street. He said that Pasquale had a restaurant in Helena for a lot of years before retiring from that business. Now he only did a food wagon at festivals in the area. Turns out, Pasquale is like 85 years old, or something like that. I did hear that this was the best place for tamales. 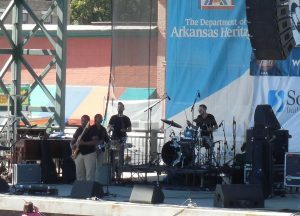 We headed down to hear Hezekiah and Lil Poochie play at the Lockwood Stage. They were already on and playing when we arrived. We found seats on the curb and in the shade. You could tell they had been together for a long time. They don’t really finish their sentences and yet they know what they are going to play. Lil Poochie seemed to forget the words now and then, but he could still play guitar. It was great to hear from some of the old guys with a lot of history. On our back in to the mains stage, we stopped by and got a pack of 3 tamales. Rich got some chicken wings as well. The neighbor was not wrong. These were some of the best tamales I’ve ever had. Oh my gosh. I did take a few minutes to talk to Pasquale since there was no one else in line. He was a great talker and quite the salesman. I told him his tamales come highly recommended. He agreed and said he recommended them, too. We ate our finds of the evening as we listened to Andy T and Nick Nixon, minus Nick. Apparently, Nick had not been well and was out of commission for a while. In his place, Andy T brought in Alabama Mike. This guys was quite the crooner. He had a way with song and we enjoyed the set. Best Tamales so far! I really enjoyed these. Wow! The neighbor said his daughter had gotten him a dozen for Christmas. They came frozen. He pops one into the microwave when he feels like having a real treat. Hmmm. There’s an idea for a Christmas gift. Then on to the stage comes Toronzo Cannon. We’ve heard Toronzo about 5 times now. 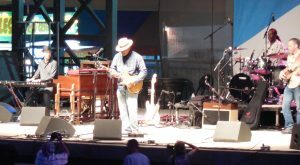 He is a Chicago bluesman with a great sound and I love his storytelling in his songs. He had a new CD come out on Alligator Records, which is Rich’s favorite label. Toronzo did not disappoint us. He put on a great show. The crowd loved him. After the set, Rich went down to pick up the new CD and talk to Toronzo. Like I said before, that’s the beauty of these things. You get to actually talk to the performers and get them to sign the covers. When Rich got his turn to talk to Toronzo, Mr. Cannon exclaimed that Rich’s hat was a Dobbs. Apparently, Toronzo loves Dobbs hats. 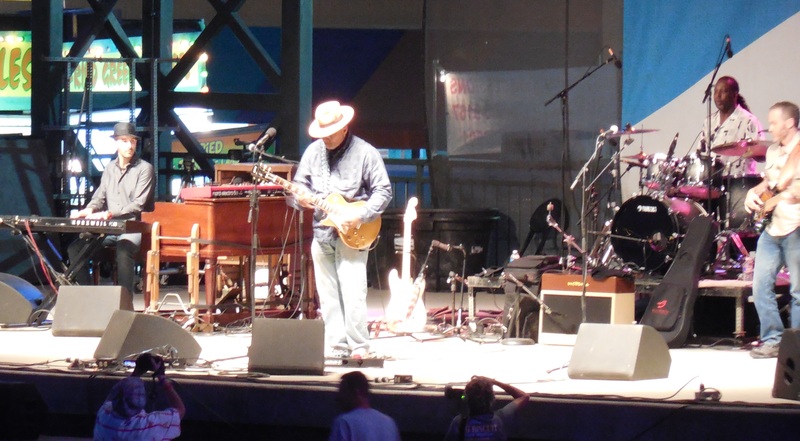 They talked hats, blues, and a little bit of everything. Rich even got his picture with Toronzo. As Rich was waiting in line, the people around him were talking about Toronzo. So Rich had to fill them on what they didn’t know and what they should know. He was selling Toronzo to the novices. That’s how it goes. You talk to fans and wannabe fans all around you. Everyone likes to share their stories. By this time, the sun was down and it was getting chilly. We had our jackets and I had my blanket. Unfortunately, we had a group of 40 something women up the hill from us who had been drinking most of the day. One of them had quite a cackle when she laughed, which was a lot. They were trying to talk over the music and laughing. If you want to talk, go to the VIP Tent. I’m sure they would appreciate you. We managed to get through Toronzo with them. It was cigarettes and cigar that got me the most though. Four people in front of me were smoking away at one point and I had to get up and get out of the cloud. I don’t mean to be militant about the cigarettes, but my allergies just get worse and worse with age. I’m surprised I haven’t developed asthma with it. Lucky so far, I guess. Rich was getting bothered by the cigar smoker a couple of seats down from him. Now, he does have asthma and I was worried we were going to have to leave. Sorry, but just because it is outside doesn’t make it alright to light up and smoke with so many people around you. 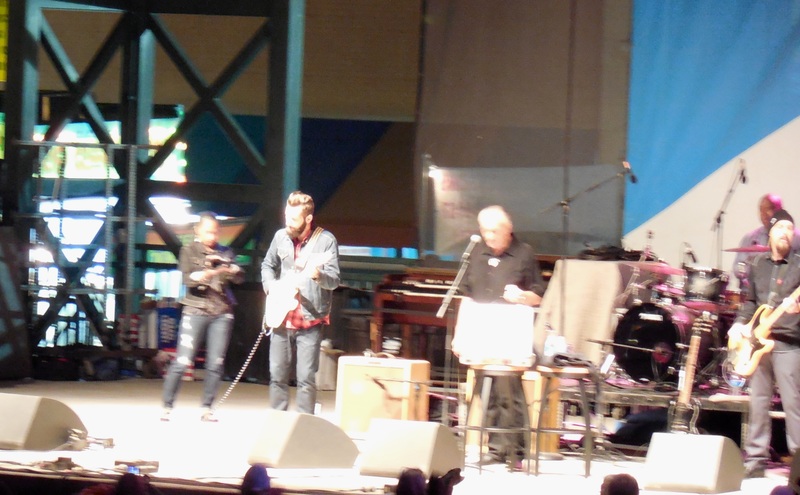 Charlie Musselwhite was the last headlining act. He is quite the harmonica player. He started out in 1966 and has only been getting better. He told stories between the songs and played some great blues for us. It was awesome. I’ve heard Charlie for a while and he was one of the reasons for coming out this year. For his encore, he played Rich’s favorite song. That was a great way to top off the evening. The cold kept us from lingering too long after the show. We got back to the car and unloaded the wagon. Time to head over the bridge and back to our warm hotel room. First things first though. A nice hot shower to wash away the smoke and warm up. That just made me sleepy. I still had a couple of blogs to write. After the second entry, it was time to read a bit and then drift off to sleep with all that wonderful blues music playing through my dreams. 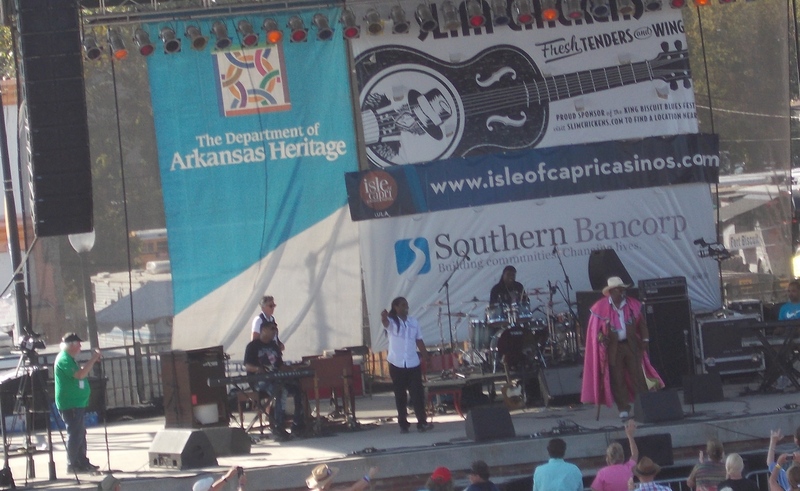 We skipped the first day of the King Biscuit Festival for our day in Vicksburg. 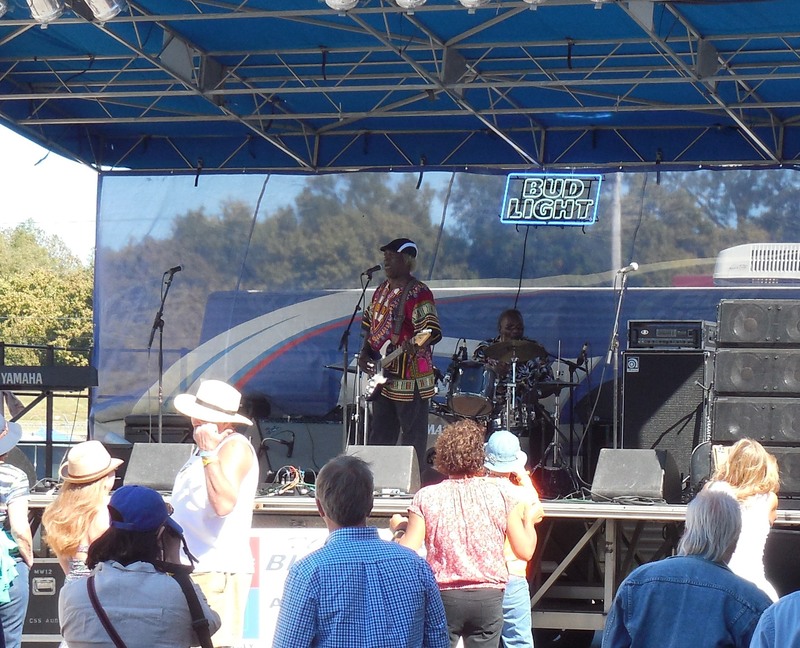 Today, we would join the masses to listen to blues music, eat great food, and imbibe a bit. The weather promised to be a bit warm today with a cooler evening. At least it wasn’t raining like the last time. The high would be 88 and sunny. We got up and shuffled about our morning before we packed up and headed over to the Rest Haven for breakfast. Now, we are in the south and things move at a different pace here. We got inside and someone let us know to just sit down. It was fairly full, but mostly regulars by the look of them. They weren’t in any hurry, so we thought we shouldn’t be either. It took a bit to get menus and the waitress\cashier\owner came by to take our order. We ordered omelets, side of gravy, grits, and toast with coffee. Somewhere along the way, my side of gravy got lost. It took about 15 to 20 minutes to get it to the table. It was worth the wait though. The sausage in the omelet and gravy were wonderful. This was a great start to the day ahead. Before we left town, I had to stop by the grocery store for supplies and try to find a hairbrush. I left mine at home and had nothing to curl these bangs with. Uncurly bangs are a recipe for disaster. I couldn’t get them out of eyes! I picked up picnic supplies for the stage area as well as some snacking stuff. When we checked out, I saw the manager from the restaurant where we just left go across the front of the store. He nodded hello. Wow, I felt like I belonged in town. Forgot how a small town could be. After getting gas at the busiest station I’ve ever been in, we let the navi (GPS) take us out of town. I had no idea where this was going. It seemed to be out in the middle of nowhere. Rich assured me it was headed to Helena. We went past a Blues marker and Rich mentioned he saw it. 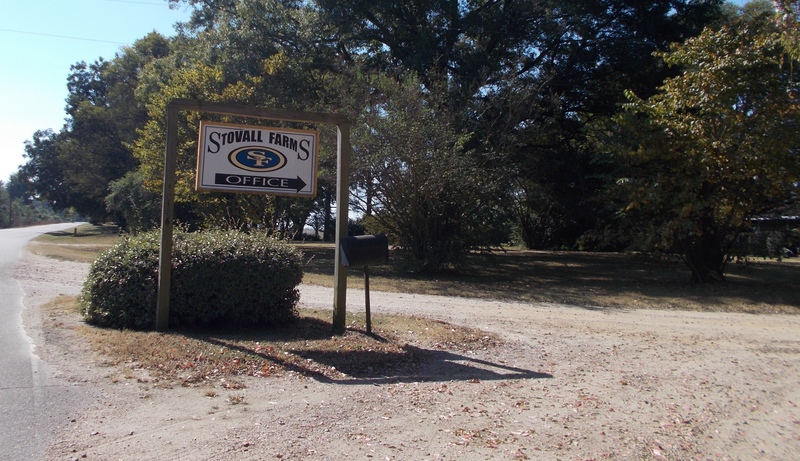 Then I saw the Stovall Farms sign. No way? This is the Stovall Plantation site? 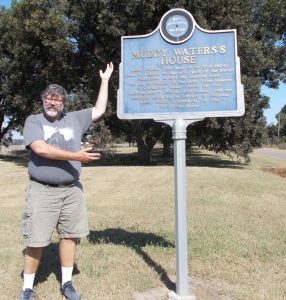 Where Muddy Waters grew up and worked? I turned the car around to go back to the sign. Sure enough, it was a Blues marker for the location of the house where Muddy Waters grew up and lived. This is the house where his grandparents brought him after his mother died when he was 2. So cool to find this thing. We took pictures and then got back on the road. We popped out onto Hwy 49 going west across the Mississippi River into Helena, Arkansas. Since we had been here once before, I knew right where I wanted to park. The local high school has parking for $5. The donation goes to help their athletic department. Seems like a really good cause. The location is close to the festival and easy to get out. The young ladies were in place and ready to take money. We walked down to Will Call to pick up our wristbands for admission. The festival itself is free. However, seating in the Main Stage area costs you. I figured it was worth the first time to see the faces of the performers. And it was. So I paid again to sit down and face the stage. We picked up our commemorative t-shirts at the same time. Back at the car, we loaded up the wagon with chairs and other necessary items to enjoy the day. After entering the stage area, we found that the right side of the stage was pretty open. It meant hopping the wagon over the railroad tracks, but that was pretty easy. We set up chairs and settled in. Then it was time for a foray into food. 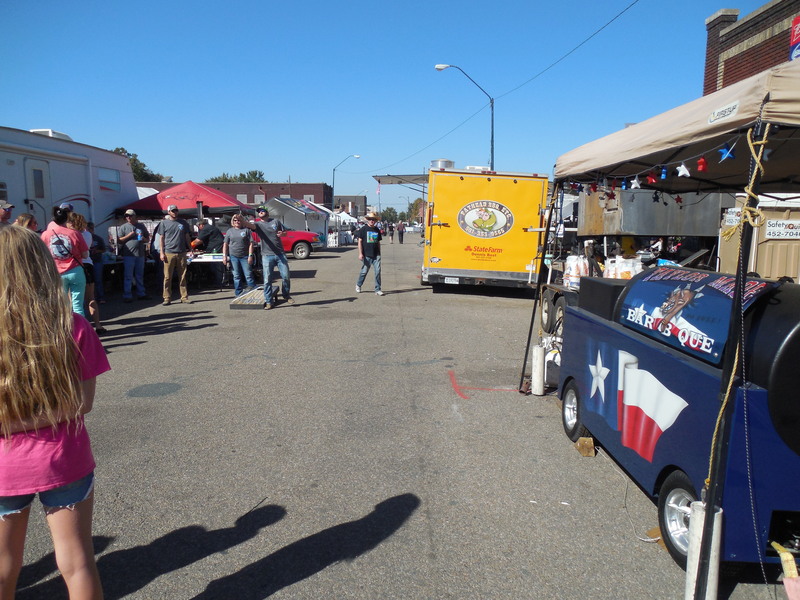 Down on the street, we walked through the vendors to determine what might be good. We settled on curry goat from the International Food tent. 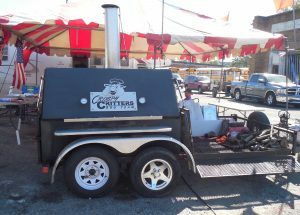 They were cooking up all kinds of good things on large griddles. I hadn’t had curry goat in a few years. Time to try it once again. Rich got tamales from one of the local vendors. With our food, we headed back to get beers and settled down to music. Rich got an Oktoberfest and I got something called Love Honey, which was a bock. The beer helped since the curry was a little more than on the spicy side. Still great though. 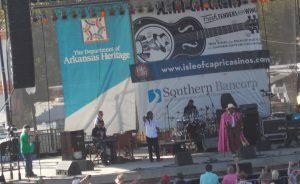 The first act was Blind Mississippi Morris. He must have been blind to where that bright neon green suit! Put your eyes out! He was a great harmonica player though. Next, The Mike Wheeler Band came on. These guys are from the Chicago area. Really enjoyed listening to them play. This would be our first CD buy of the festival. Rich went down to Bubba’s to stand on line for a CD and get Mike to sign it. That’s one of things I love about these festivals. You buy a CD and get to talk to the people you just saw. 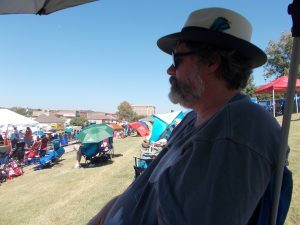 Rich had to wait for a while since a lady with Big City Rhythm and Blues was talking to Mike. He came back with a great story about standing there with Mike while she talked. Nothing like getting the gossip from the source. We’ll be checking out the Mike Wheeler Band at home, too. 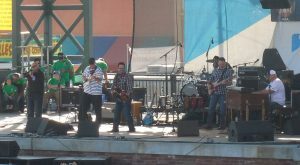 Kenny Neel and his entire family seemed like they were on stage as the next act. Mr. Teddy, the owner for a juke joint in Louisiana where Kenny’s family has played for something like 6 generations, introduced Kenny. 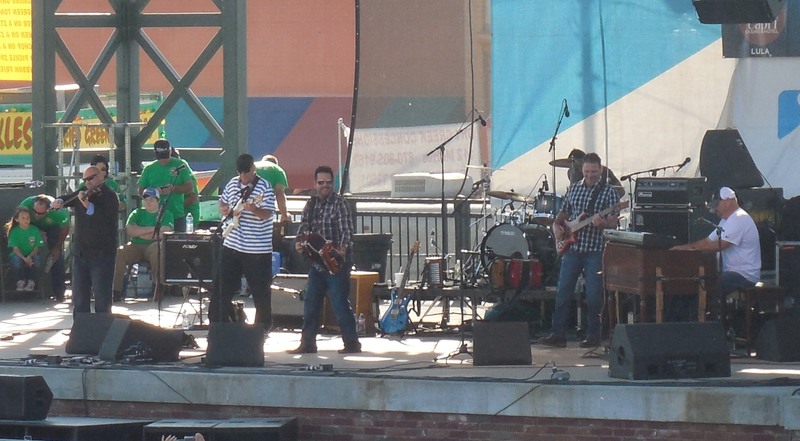 The brothers play in the band. Kenny brought a nephew on to play for the crowd. He said he was working to bring up the next generation of Neels to carry on the tradition. Mike Zito came out next. I’ve tried to see him play before with no luck. Strange, he sounds little like John Mellencamp. I did enjoy the music though. Anson Funderburk and the Rockets came out next. 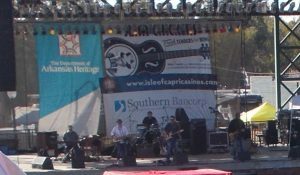 This band is a local favorite and plays here every year. This year, they had a new lead singer named Ray. I didn’t catch his last name, but he was awesome. 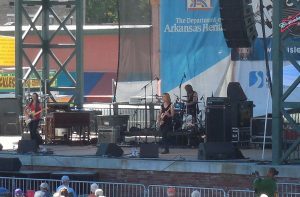 For those who don’t know the name, Anson Funderburk was a member of the Fabulous Thunderbirds back in the day with Kim Wilson. The sun was going down at the point. It had been a very hot and sweaty day for us. The temp was somewhere around 90 with the sun beating down. We had our umbrellas on the chairs to shade us, but that didn’t cut the heat. After the sun went behind the trees, we realized we didn’t bring our jackets. 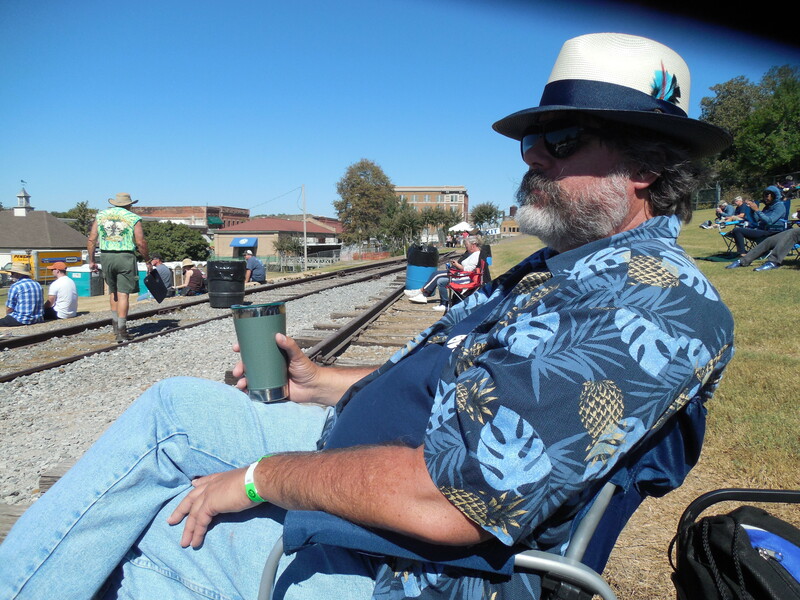 It was chilly out on the levee with no coat. I had a blanket I brought, but Rich didn’t get a cover up. 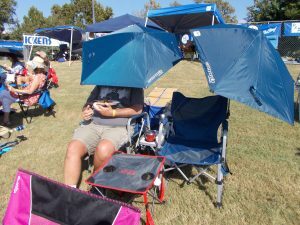 Luckily, the temp was only in the mid 70s by the time the show was over. Still warm enough not to freeze, but a bit chilly with the wind. Coats tomorrow for sure. 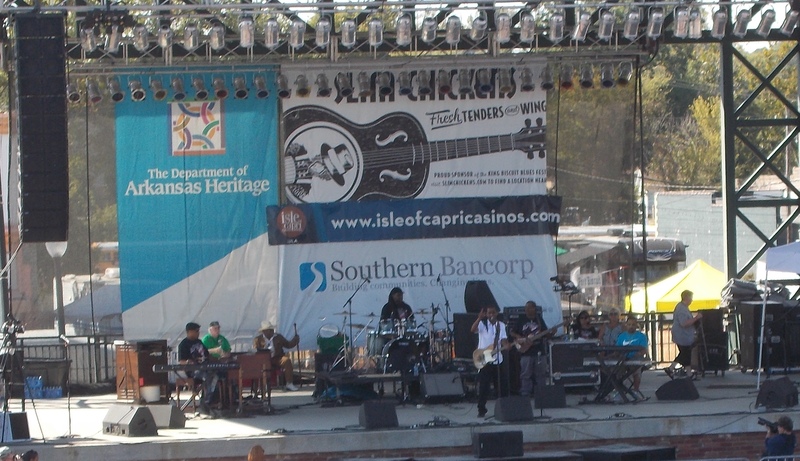 The next group was from New Orleans. 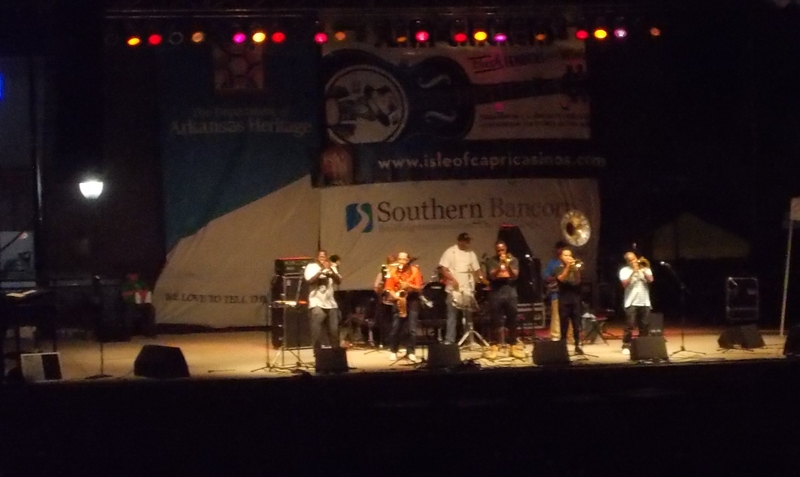 The Rebirth Brass Band was a group of young men who won a Grammy this year for their work. They were absolutely amazing. 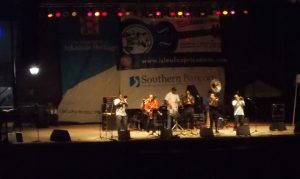 Two trumpets, two trombones, one sax, and 2 percussionists. They made the music into an art form. Rich didn’t care for the brass (and a little woodwind and percussion) too much, but he admitted it was very good. That brought us to the headliner for the evening. 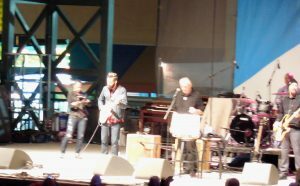 John Mayhall is 82 years old. He is known as the Grandfather of British Blues. He and his band, the Bluesbreakers, have started or promoted the careers of some the premier musicians in Britain. Here are a few: Eric Clapton, Mick Fleetwood, John McVie, Jack Bruce, Mike Taylor, Peter Green, Walter Trout, and Coco Montoya. From a history perspective, this is one of those guys you have to see. His show turned out to be really great. He did it all. He played guitar like a master, handled the organ and synethizer with ease, and managed a pretty good harmonica. 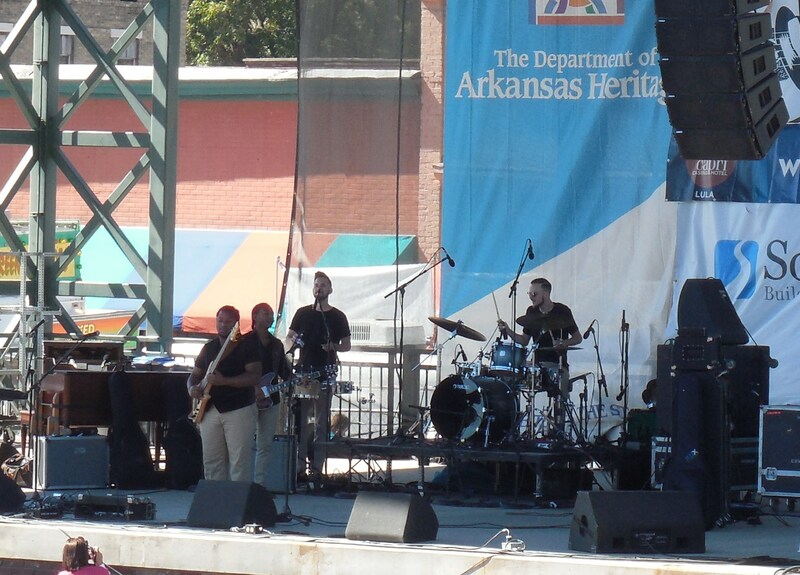 The drummer and bassist with him were from Chicago. They were great at rounding out the sound for him. At the end, they were fighting over who got to introduce John to the crowd as the final bow. John seemed OK with letting them fight for the mic. The drummer won the contest and handled the job with precise drummer skill. By the way, John and I share a birthday about 50 years apart! Now for the bad news. We were into the Anson Funderburk part of the show when a group of 5 girls and three boys sat on the grass behind us. Immediately, they started talking loud to hear each other over the music. These kids were somewhere in their 20s. They didn’t pay any attention to the music around them. One by one, the people around them moved. They didn’t notice that they bothered anyone. Rich refused to move, but it gave me excuses to turn around and stare at them from time to time. At one point, I thought Rich was going to yell at them. They were babies who had no idea how rude they were. Around gossip, Facebook, and other inane things, it turns out the girls drove down on a lark. They had no place to stay and little or nothing with them. They were sitting on the ground and couldn’t see anything. The boys at least had a hotel room. From the conversation I couldn’t help but overhear, the girls were sleeping in the car down by the marina that night. Wow, that’s more than I would have done at that age. 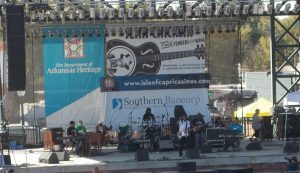 When John Mayhall came on stage, this group of kids seemed to know the name. However, they knew the first two lines of one song. That’s about the extent of their knowledge. 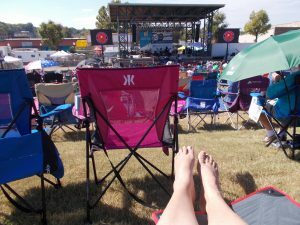 I was totally amazed that they would spend that kind of money to sit on the grass and not listen any of the music. What a waste of time and money. I wondered how they afforded that for all of them. When the music was over, we stood up to pack. The area behind was littered with dozens of beer cans and containers. The kids got up and didn’t attempt to pick up after themselves. I wanted to scream at them for being so ignorant about their surroundings or what someone else was going to have to do to clean up their mess. Who lets their children do this sort of thing! Let it go! It took a while to breathe deep and let the stress drain from me after dealing with that mess. I wanted to so punch a parent for not doing their job. We got back to the car through the crowd. After unloading the wagon and packing things away, it was time to hit the road. We got in line and made our way to the bridge over the Mississippi. Now this bridge is very steep. I had a sick feeling in the pit of my stomach as we drove over it in the daylight. It wasn’t any better at 10:15 PM. Traffic was slow going down 49. At one point, we were all passing a VW mini bus that couldn’t do over 50 at best. Once we got to 61, it was 70 miles an hour all the way into Clarksdale. Some of the cars were going a bit faster than that. I couldn’t tell you how fast because they zoomed by and left only tail lights. We arrived at the hotel and gathered our stuff to take up. We got into the lobby as other festival attendees were returning. Everyone was talking about the experience and asking questions. Once up stairs, it was hot showers and decompressing before turning in for the night. There’s always tomorrow. We are back in the land of southern comfort food and humid temperatures. I love it! 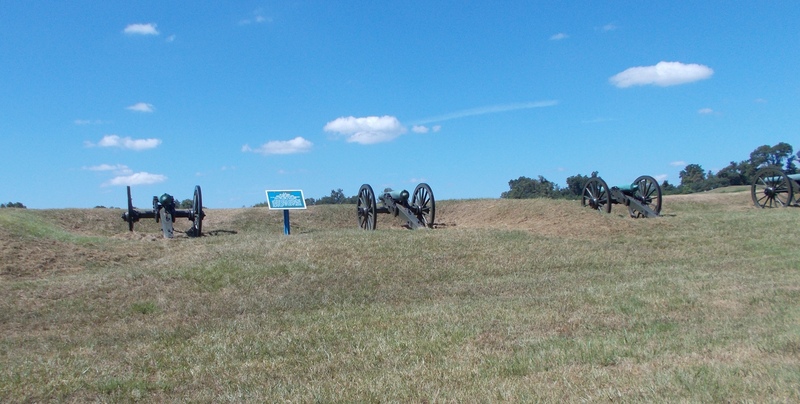 Today, we decided to explore the Vicksburg battlegrounds and site of the famous siege that broke the Civil War. I’m a history nut and read a lot of histories. The Civil War has been a particular time period that I like to read about. Even Rich has read Shelby Foote’s “The Civil War.” That’s all three volumes, too. I recently had created a family tree for our friend, Doug. It turns out that his third great grandfather fought in the Civil War at Shiloh and Vicksburg. Doug has an interesting family story about Michael Mason’s involvement in a crucial point of the siege. I would love to prove the legend for them. It would be a great research project. 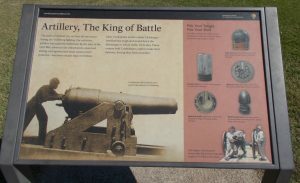 In the meantime, we headed to the Vicksburg Military Park with the intention of finding the locations where the 1st Illinois Light Artillery Battery E would have been during the siege. Michael would have been at one of these locations. 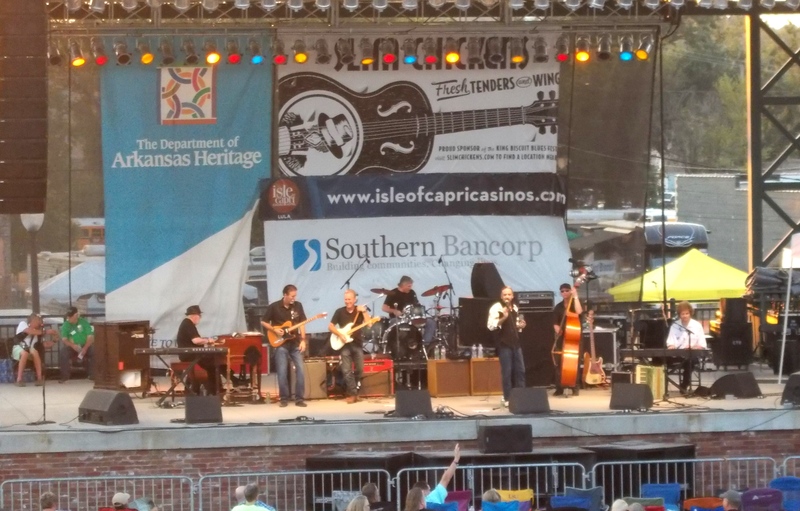 It’s a 2 hour drive from Clarksdale down to Vicksburg. The road is pretty straight and extremely flat. This is all flood plain for the Mississippi River. The inhabitants just borrow it to grow cotton and soybeans. It’s harvest time out here right now. We see lots of large tractors and combines out picking the crops. It’s busy out here. You can tell where there is work because of the dust clouds that hang over the machinery. Today’s temperature was going to be about 89 degrees. With the river close by, the humidity was also expected to run pretty high. The sun was beating down as we drove. By noon, we had turned on the air conditioning in the car again the humid, hot weather. A battlefield in these conditions would be a little bit of a challenge. At the park visitor’s center, we stopped to talk to one of the rangers for more information. We got printouts for the regiment. 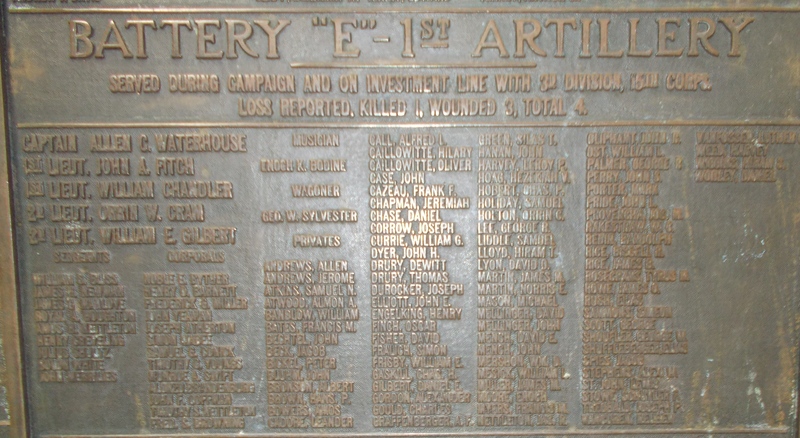 A memorial stone to the regiment is located in the area where they were stationed. The ranger marked up the map for where three of the Union signs are to indicate Battery E’s locations. 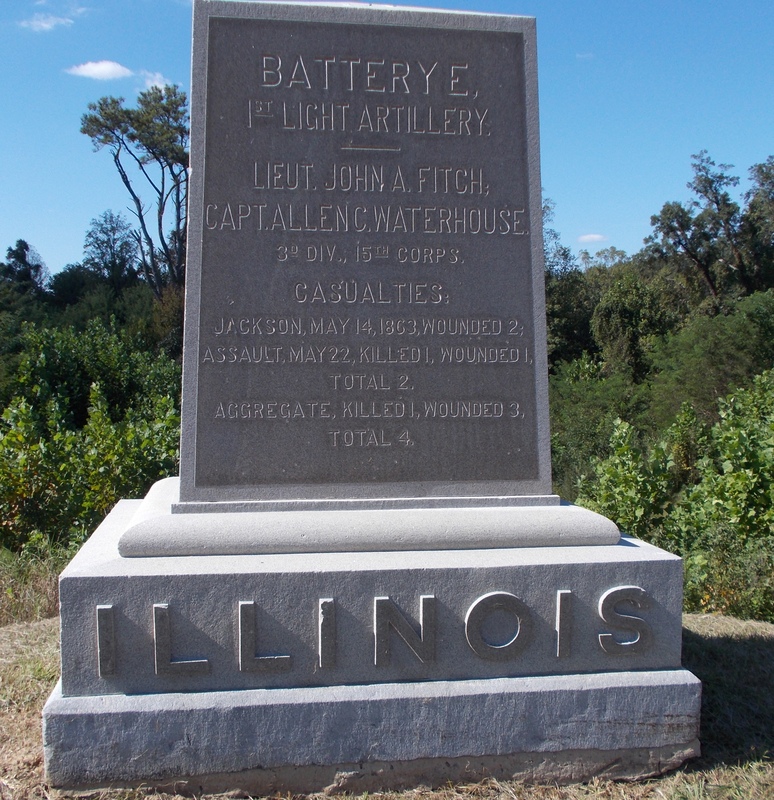 The Illinois state memorial is also marked on the map. Michael’s name appears on a roll of the Battery inside.the rotunda. 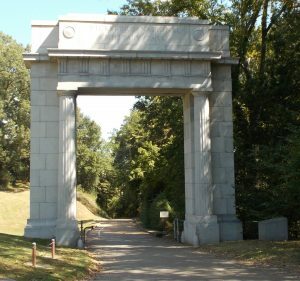 The park opens with a large military archway. The drive is through very hilly landscape with a lot of ravines. I can’t image trying to fight your way forward through this. Signs tell us that there were no trees in the area. The Confederate forces had stripped the landscape of anything that could be used to erect barriers against the advancing Union army. Amazingly, there are pictures from the time period. There is not one tree or bush. There is barely any grass out there. The dusty dirty in the dry weather would have choked everything around it. In our pictures, it appears very lush. You just have to image the hills and dales totally bare of anything. The drive winds through the Union lines with the various regiments from each of the states involved. We see Wisconsin, Illinois, Ohio, Indiana, Michigan, Iowa, Kentucky and several more. We make sure to stop at the Michigan monument. With the blue skies as a background, it is a beautiful memorial to the lives put on the line and those that were lost in service. At Graveyard Road, we finally come to the locations for Battery E. We find the first one with no problems. It is amazing to see the round, earthen mound that protects the gunners. 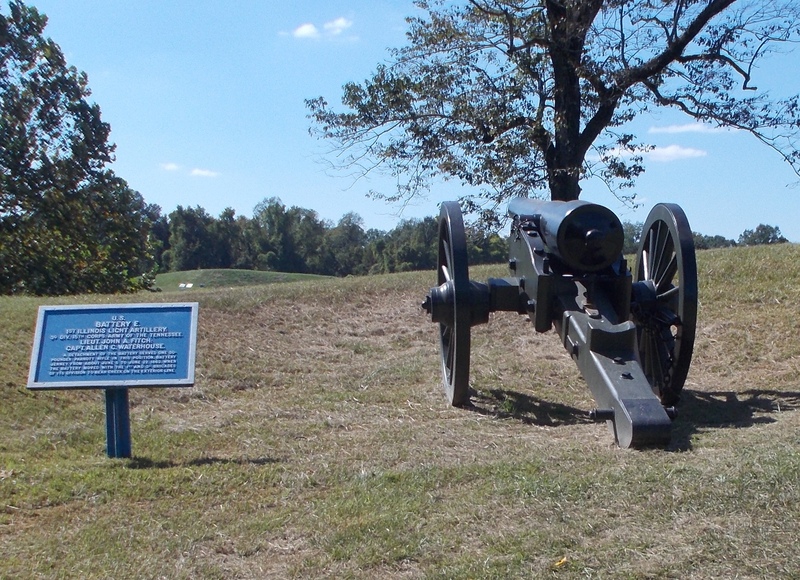 The barrel of the cannon peaks over the edge and is pointed directly as a Confederate held hill in the distance. On the map, the next marker appears to be on Union Avenue, so we continue around. 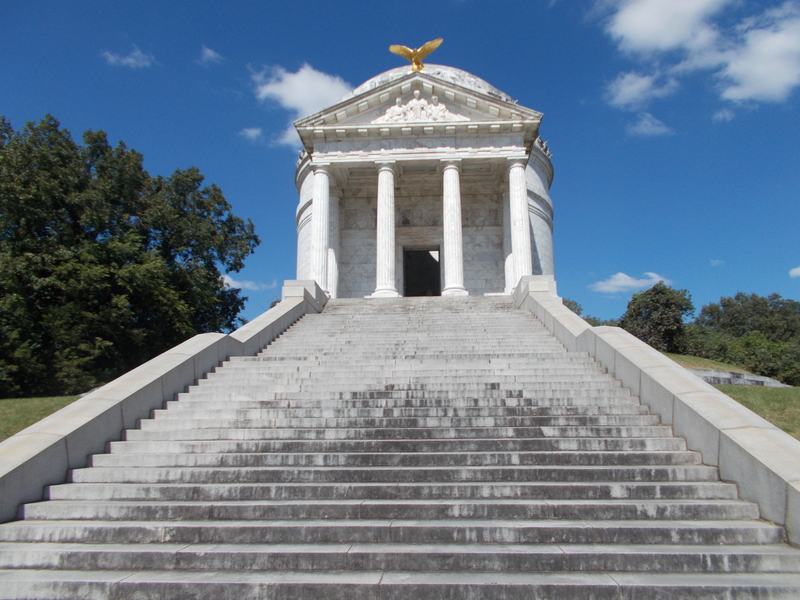 We’ve been seeing the rotunda on the Illinois memorial from the battlefield. The road leds directly to its front door. Here, there are the renovated Shirley house, which sits on its original site. The Shirley family owned the farmland that become the site of the siege. The Union army camped around the house and destroyed a lot of the land and house to provide protection for the troops. It’s nice to see this example of farmhouse restored here. Walking up to the Illinois memorial is impressive. They wanted to overwhelm you to make sure the sacrifices here were not taken for granted. The marble stairs led to a rotunda also of marble. On the floor is a seal for the state with the dedication date. There are pictures that should a large crowd attending the dedication. It is amazing to see all of these people. 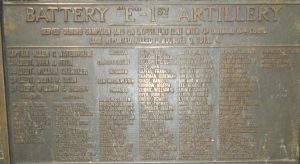 Rich finds the Battery E roster in the bronze plaques on the wall of the rotunda. Listed in the roll call is the name of Michael Mason. We take plenty of pictures of the plaque and around the memorial. Inside, the acoustics are so nice. I can see why the choir director was in the park office trying to bring a group in to sing. He was turned down on the basis that this is a memorial and not public site for that activity. We continue the drive around the park. Using the map, we can’t locate the other Battery E sites. They don’t appear in the locations that the ranger marked for us. In frustration, we continue around the road through the battlefield. We see a site marked Thayer’s Approach. This is an impossible site at the foot of a very steep hill over extremely rough terrain. The sign explains that Thayer was trying to stop mining efforts by the Confederates at this site. We see blue Union markers going up the hill. They didn’t gain their objective, but they did a good job of making there up to the top with little causality. They were repulsed at the top of the ridge for all of their efforts. Back in the car, we continue down the road to the next stop for the U.S.S. Cairo Memorial. This side of the park runs pretty close to the Mississippi River. The U.S.S. Cairo was one of 7 ironclad ships built to operate on the Mississippi by the Union Army. The Cairo went down during the siege and was later located and raised. The remains are in a protective cradle and covered from the elements. The remains are mostly the hull of the ship. Replacement pieces were added to show structure. The memorial has walkways so you can look down onto the remains and see the internal structure. It is very cool to get this look into an ironclad. 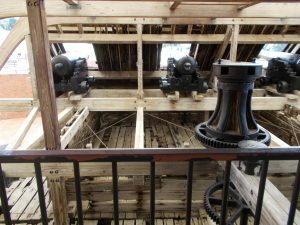 The original iron plates, boilers, and other metal structures are in their places throughout the ship. If you love history, this is a great exhibit. Coming out of the Cairo memorial, you go past the National Cemetery here. 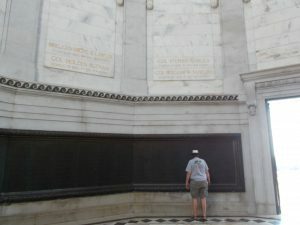 There are rows and rows of stones dedicated to the Union and Confederate soldiers and sailors who lost their lives in the conflict. At the top of hill, you are behind the Confederate lines. At the top of the hill is the command center that looked down on the conflict. This is the highest point in the battlefield. Our first stop was at the top of the ridge above Thayer’s Approach. From this point, we can see all of the blue Union markers for the groups trying to take the hill. The last of the markers are about 25 feet from the top of the ridge. Miraculously, the number for those killed in the ascent was small. I don’t know how though. They were looking right up into the gun barrels of the soldiers over them. Because we couldn’t find the last Battery E markers, we decided to drive down Graveyard Road to attempt to locate them. But first, we stopped at the top of the hill to get a view down on the Union lines. It was amazing to look down and see into the batteries and lines of the Union spread across the hills. I looked down from the top and at the foot of the hill was the last of the Union position. They were literally right under their noses. We could see the first Battery E position out at the far end of the field. We assumed the other two would be somewhat in a line across from them. Back in the car, we drove out to that area and parked. Across the road, we found the Battery E memorial stone. It wasn’t on Union Avenue at all! We got some good pictures as proof of the find. From here, we walked up the hill to check for another Battery E position. That marker wasn’t Battery E, but we could see yet another position hidden from view. This was the second Battery E we were looking for. Searching around the hillside and through the weeds and trees, we couldn’t locate the last position. We assumed it would be in a line or at least located close by the first two. That didn’t prove to be the case. We had to give up and be satisfied with what we could find. We went back to the Confederate line and finished the road back to the Visitor’s Center. This was only one half of the park. We never made it across the road to the next set of sites. It was late in the afternoon and we were more interested in food than battle sites. In the parking lot, we went through our options. Turns out, The Gumbo Pot where I was planning to eat didn’t open until 5:00. It was 3:30 and we were starving. Nothing else seemed to jump out at us, so we chose the Rowdy’s Family Restaurant. Great choice. There was one family inside so we had the place to ourselves. Rich ordered catfish and I went for the shrimp and grits. Lo and behold, no shrimp and grits to be had since they ran out the night before. I ordered the shrimp and chicken platter then. Darn. I had my heart set on that. The food took a bit. But then when they cook just for you, it does take a while. The wait was well worth it. Everything was delicious and fresh. Of course, it didn’t hurt that we would have eaten anything at that point. 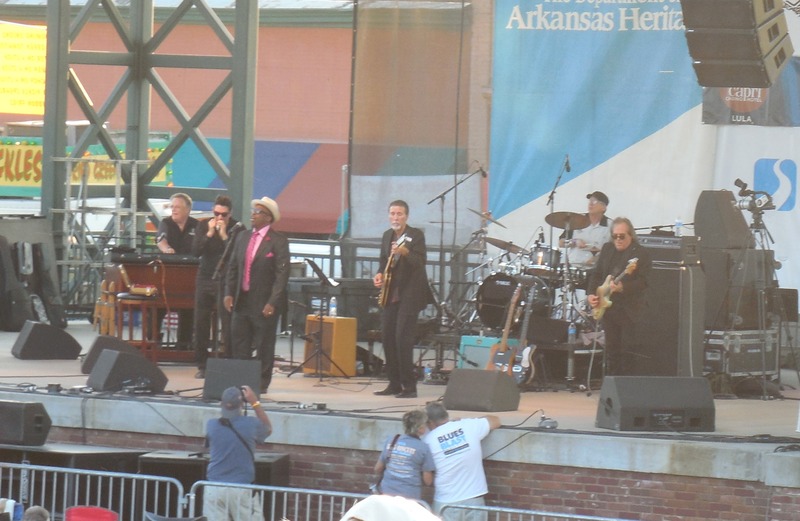 Then it was time for the long drive back to Clarksdale. We left the hotel about 10 this morning. It was about 8 when we got back in our room. Needless to say, it was time for a hot shower and some time to kick back and relax. Education sign with the cannons explaining artillery in the battle. 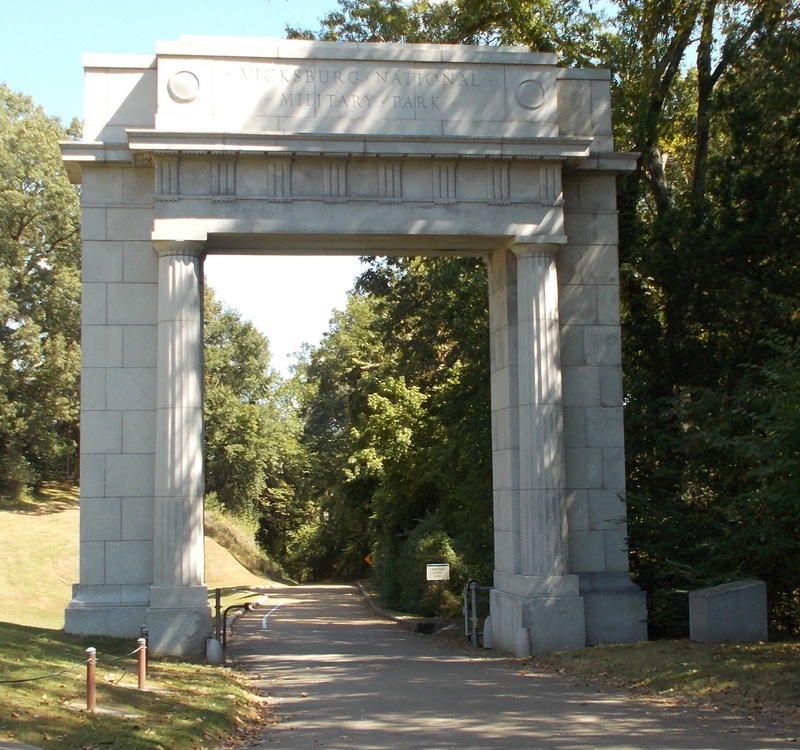 Archway at the entrance to the military park. 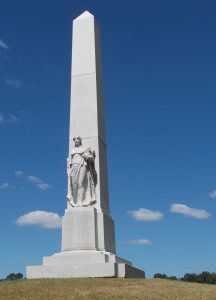 Michigan memorial to their troops in the battle. Artillery positions at the site of the Michigan memorial. 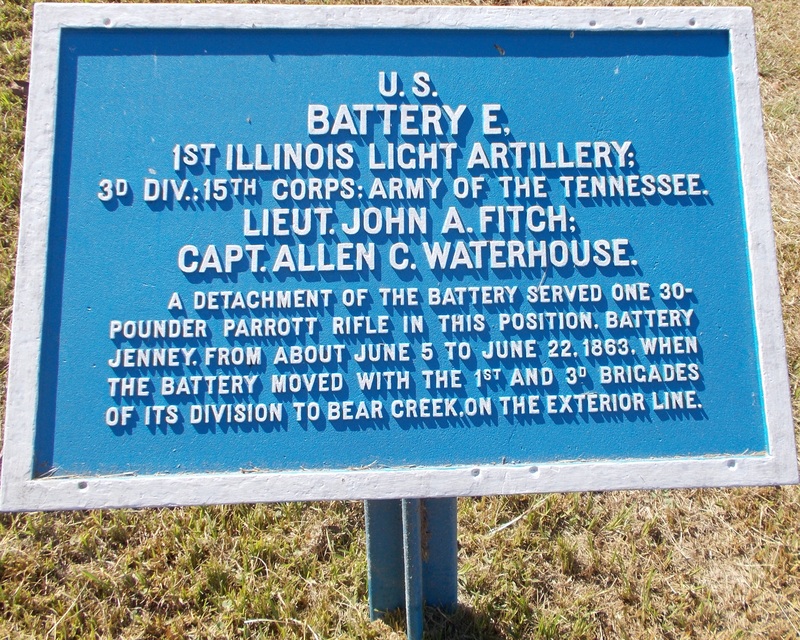 Plaque marking the first of the Battery E positions. 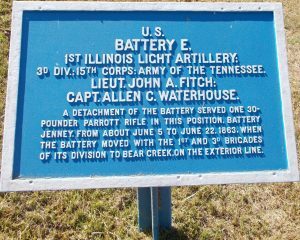 Battery E position on one side of Graveyard Road. 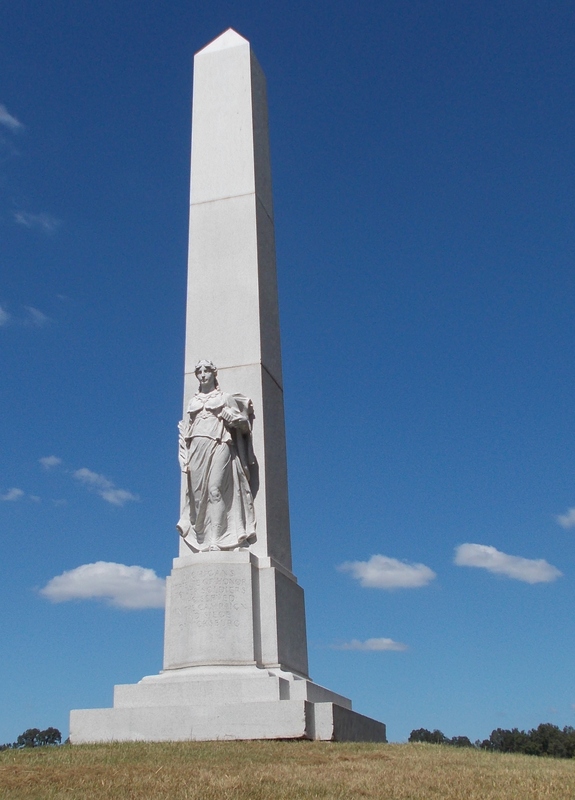 Illinois monument to their troops that found at Vicksburg. 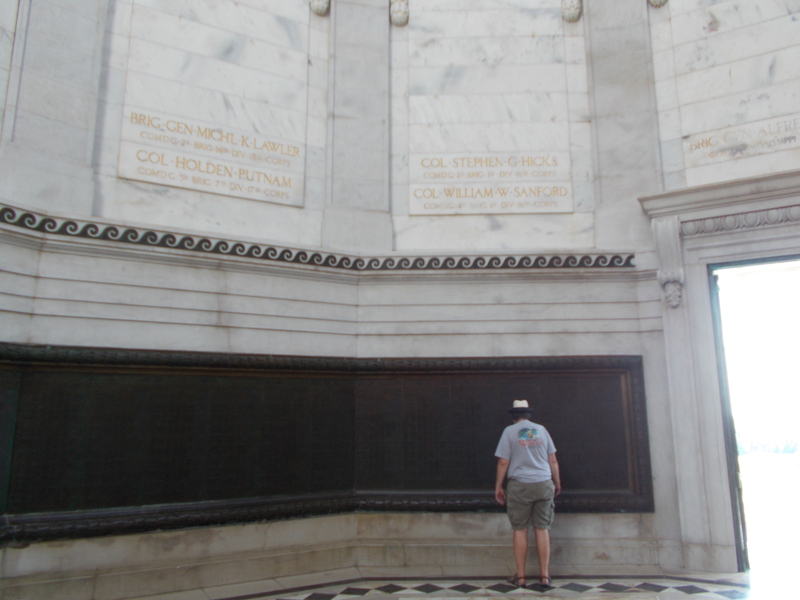 Rich reading the plaques for each regiment looking for Battery E.
Michael Mason on the Battery E plaque. Standing inside the U.S.S. Cairo and looking to the front ironcladding at the cannons. 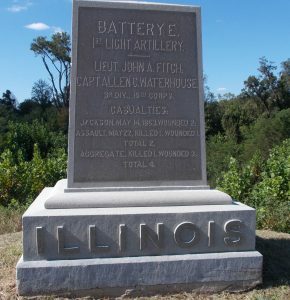 Memorial stone dedicated to Battery E of the 1st Illinois Light Artillery regiment. 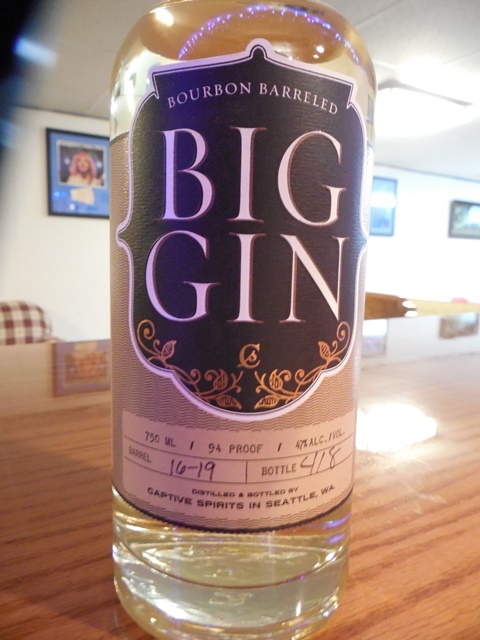 I bought this gin a couple of years ago when I first heard of bourbon barreled gins. I like gin and love bourbon, so this was something I had to try. 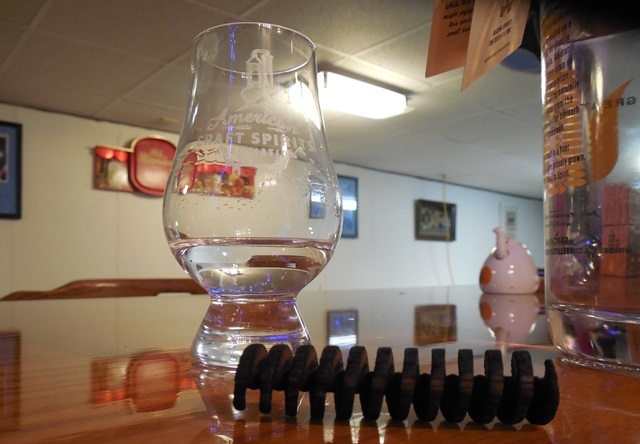 Captive Spirits produces the gin and then put it into a used bourbon barrel to finish. I believe they can’t say that it is aged in bourbon barrels because gin is not an aged spirit. That is why the label says barrel finished, barrel rested, or just mentions the word barrel. The barrel aging process gives this gin another dimension to complement that juniper berry and spice taste. The gin I tasted is bottle number 418 from barrel number 16-19. The bottle I bought almost a year ago was also from barrel 16-19. This gin doesn’t appear to be a fast seller, which is too bad. I have to say that I have enjoyed this gin and plan to keep a bottle on the back bar. This gin uses a plain, shouldered bottle with a synthetic cork stopper. The label is printed in black and gold, which complements the light yellow, straw color of the gin. This color is picked up from the barrel during aging. Because the color is so light, the gin probably spent less than a year finishing in the bourbon barrel. The smell is mostly the juniper berry with some sweet caramel notes and a bourbon smell in the background. The first sip is smooth in the front and middle of the mouth, but has a little burn at the back of the mouth. A spicy, juniper taste dominates at first in the front of the mouth. As the liquid passes to the mid mouth, the nice, rich caramel taste takes over. The mouth is filled with a smooth, silky vanilla caramel and lingering bourbon with chard oak. All of this takes place as the liquid moves through the mouth and to the throat. It is a wonderful flavor and sensation to be enjoyed. 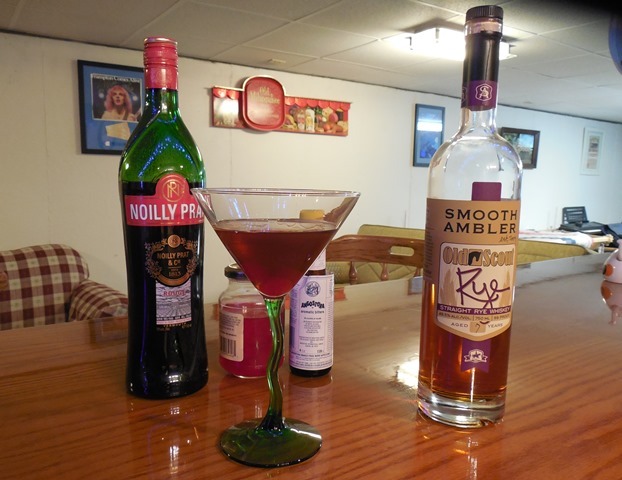 Since this spirit has elements of gin and bourbon, I like to use the elements from a Manhattan and a Martini. So this one I call it a Manhatini. Shake the gin and vermouth with ice until chilled. Pour into a martini glass and garnish with one or two cherries. This is a gin martini I enjoy every time. 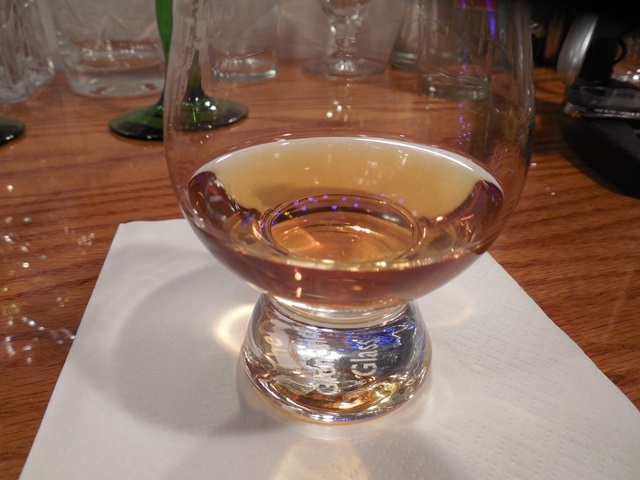 This bottle of Rye Whiskey joined the whiskey collection of the 12 Bar Blues Bar in late December 2015. It was gift I received at a job interview. This was my introduction into the world of Craft Distilling. 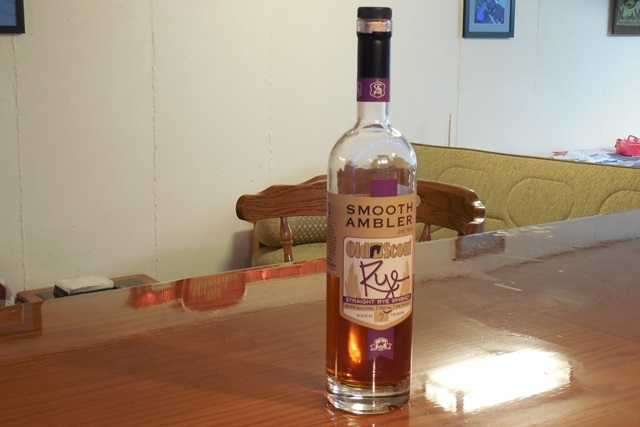 This is my favorite Rye Whiskey and in the interest of full discloser Smooth Ambler is a customer of ours. They are located in West Virginia and I am not sure how wide their distribution is but here is Smooth Amblers web site for more information. It is called Old Scout because it was not distilled by Smooth Ambler. 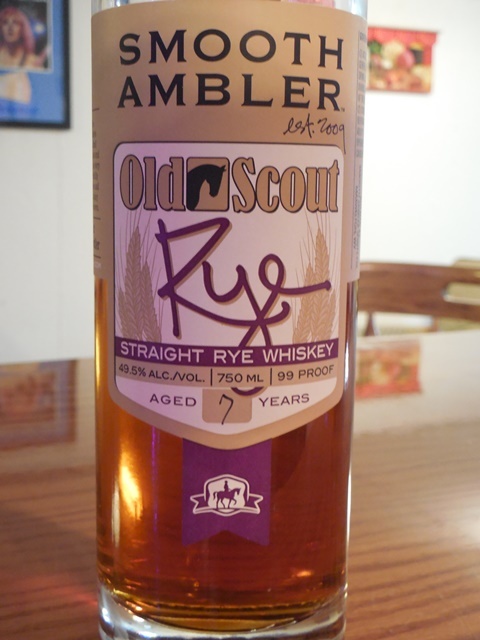 Instead they collected barrels of of rye whiskey from other distilleries and blended to create a fine example of rye whiskey called Old Scout. This is a common practice among distillers and something a young distillery would need to do if they wanted to sell a very good whiskey without waiting years for their own stock to mature. Buying and blending whiskeys is an art just as important as distilling. The bottle I am tasting today is aged for seven years and is from batch 14 bottled on May 28th 2013. It is 99 proof or 49.5 ABV. The bottle is a nice clear shoulder bottle with a cork stopper. The colors on the label are purple and gold just like my high school colors. Maybe this is why I love this whiskey. The spirit is a deep amber color like honey with a nice viscus cling to the glass indicating a good body. The alcohol does hit the nose along with a nice spice as you would expect from a rye whiskey. The spice smells somewhere between clove and allspice with hints of caramel and vanilla. The taste lives up to the aroma. The front and back are smooth with a little bite in the middle. Of course this describes where in the mouth the burn happens. The front being the tip of the tongue then the middle and back of the mouth. Do not be afraid to drink this whiskey neat. With ice the sweetness and oak from the barrels starts to come through more. It is a very hard to put down this rye whiskey. This whiskey is great to sip neat or with a couple of ice cubes. Today I will use it to make a Manhattan. Mix whiskey, vermouth, and bitters with ice until chilled then strain into a martini glass. Add a cherry and enjoy. FYI this made the best Manhattan I have ever had. Using good spirits make all the difference. 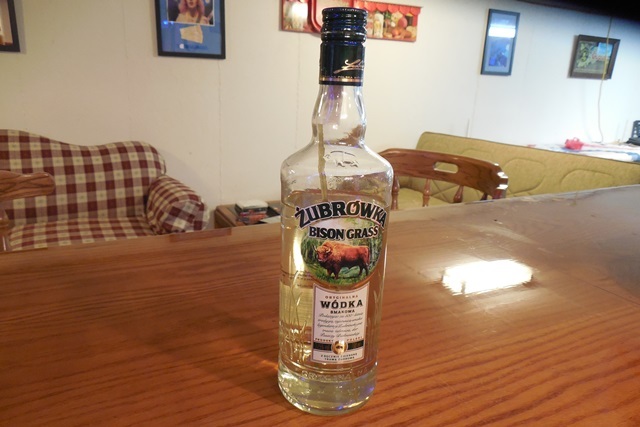 Zubrowka is a Bison Grass infused vodka from Poland and its national spirit. Until recently this vodka was not available in the USA. Apparently Bison Grass is classified as a carcinogenic and was banned. 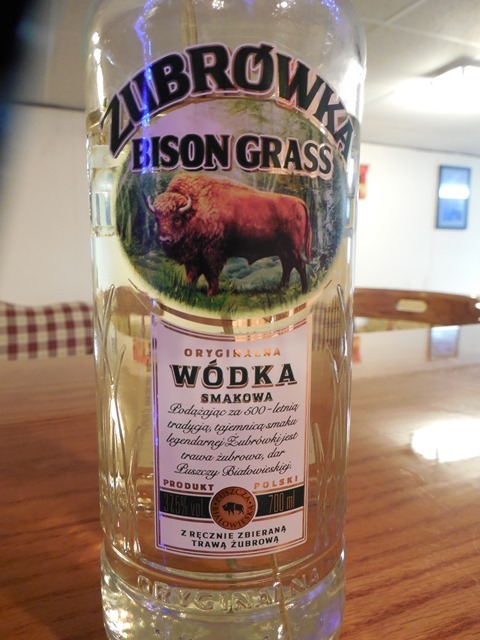 I am not sure that what is sold today as Bison Grass Vodka in the USA even has Bison Grass in it? When Joy and I visited Poland last summer, this was the first spirit I tried there. We went to dinner in the Jewish Sector of Krakow and it was on the menu. I ordered it neat, but the friends we were with had the waitress bring a side of apple juice. In Poland, this is served with apple juice. I’m using the bottle Marcin brought to me for Christmas so I am reviewing the real Zubrowka. 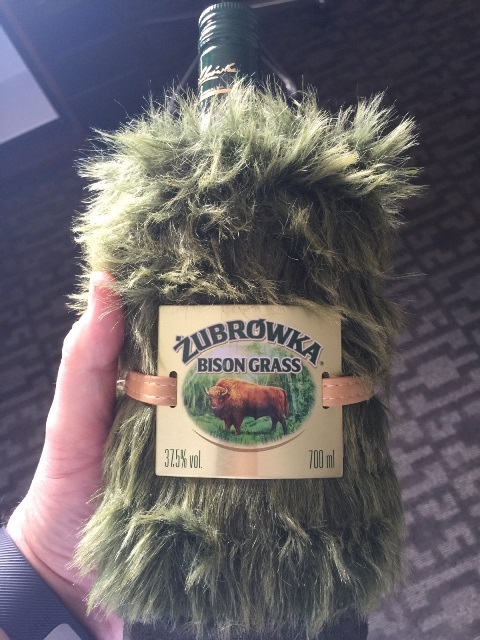 On this visit, Marcin brought me a bottle covered in grass. This is popular as a gift during the holidays. The vodka is a clear, pale yellowish green color like you would expect a grass infused spirit to look. There is enough body that it does slide down the tasting glass slowly. The bottle has a very nice Bison on the label. There is even a blade of bison grass inside, which is a little darker, yellowish green. The bottle is also embossed with blades of grass. The label is all in Polish, so I am having a hard time reading it. The alcohol level for this spirit is 37.5 ABV, which is 75 proof for us in the States. The taste has a cinnamon-like quality with vanilla and green grass tones with a sweetness. It’s not so grassy that you think your a cow though. 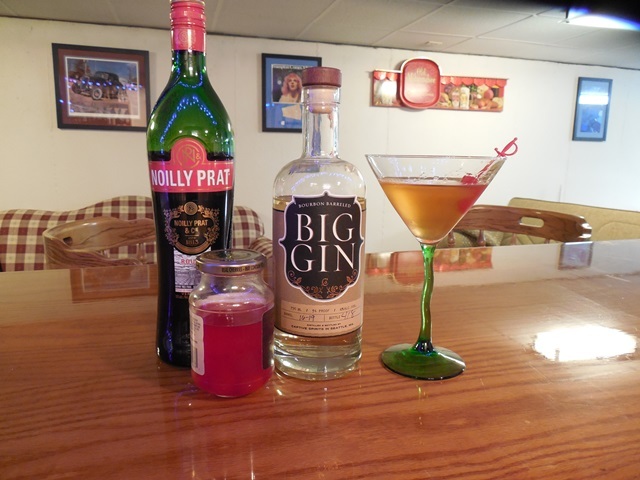 It is smooth throughout the drink and the bison grass really comes out in the aftertaste in a pleasant way. In Poland, I did drink most of it with apple juice and it went well with that. But this spirit is very drinkable neat. Ice does not inhibit the taste or smells at all. So you will not hurt the taste by icing it down. It is still slightly sweet with the bison grass spice coming through. 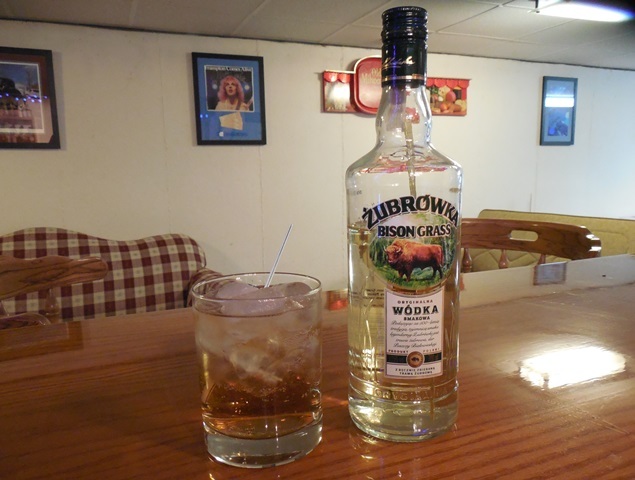 Since I did not have apple juice as a mixer, I used ginger ale with the Zubrowka. I guess I made a Bison Grass High Ball. A High Ball is any spirit mixed with a carbonated mixer. Mix vodka and ginger ale and add ice. It was a nice surprise to taste how well these mixed together. I thought the ginger ale would overpower the drink. The bison grass spice complemented the ginger ale. So I’ll sit here and enjoy the rest of Bison Grass High Ball in the 12 Bar Blues Bar. 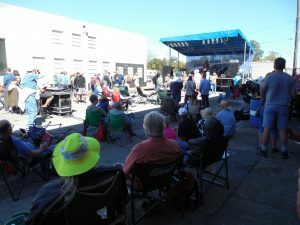 I attended the Whiskey Acres bourbon release party in early June. While I was there, I tried their corn whiskey. I really enjoyed that spirit almost as much as the bourbon. One of the drinks being served during the party was a Mojito made with the corn whiskey, which was very tasty. The flavors from this whiskey are a great complement with the lime, mint, and sugar in the drink. As promised a couple of weeks ago here is my review. The corn whiskey is unaged, so the color is clear. This spirit is not cloudy at all. 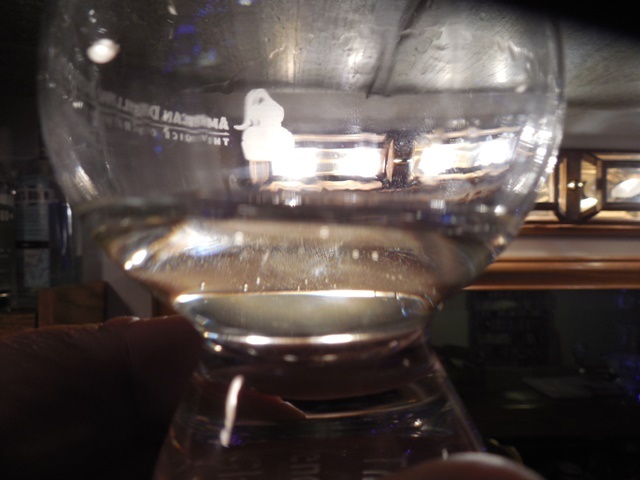 There is a nice cling to the glass, whch indicates a good body. The bottle is nice. I like the printed bottle that does not use a label. The motto on the back of the bottle is. “Great Whiskey Isn’t Made. It’s Grown.” The bottle cork is also very nice. The bottle also comes with a chard stave and a booklet telling you how to use it. 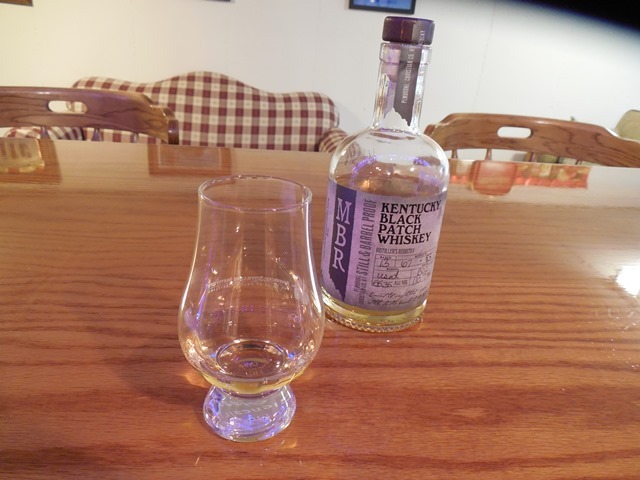 They say that it takes the supplied stave about two weeks to age the spirit and it is fun to taste the corn whiskey daily to see how it changes. I might get another bottle and try this myself. Now onto the important aspects of this whiskey. which are smell and taste. There is a very pleasant, sweet cornbread aroma. It has a little alcohol smell, but it is displaced by the butterscotch notes. It smells so nice you should spend sometime just enjoying it. The smell does set the expectation for the taste. The first sip was smooth with very little burn at the front or back of the mouth. It did warm the insides as it went down. At 90 Proof (45 ABV), this was a nice surprise. The clear spirit has enough body to give it a pleasant mouth feel. It starts with a sweet cornbread taste and then evolves into a butterscotch and caramel after taste. It might even have a faint caramel corn after taste. I would not pour it into a glass and sip it, but it is not unpleasant. Adding ice does not affect the flavor much. It might even bring out the butterscotch caramel sweetness and a little more burn. The corn notes are also very nice. While I was at the tasting, one of their summer drink specials was a Corn Whiskey Mojito. 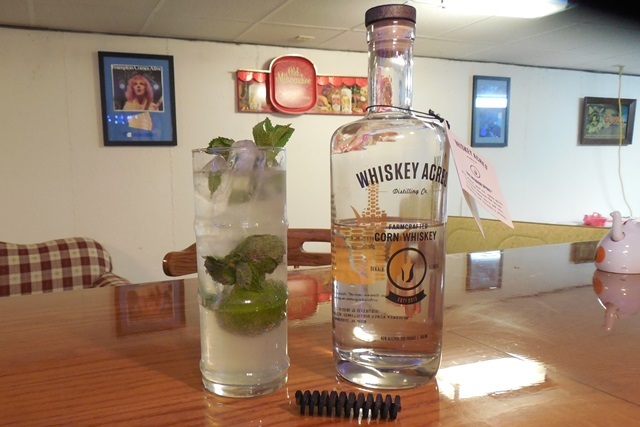 It was this Mojito that pushed me into buying a bottle of Whiskey Acres Corn Whiskey. It made the best Mojito I have ever had. The corn whiskey’s taste really enhanced the lime, mint, and sugar in this drink. So here is my recipice for a Corn Whiskey Mojito. Muddle lime, mint, and simple syrup together. Add corn whiskey and mix. Add club soda and ice to fill up you glass and garnish with mint sprig. Kick back and enjoy a Northern Illinois Mojito. 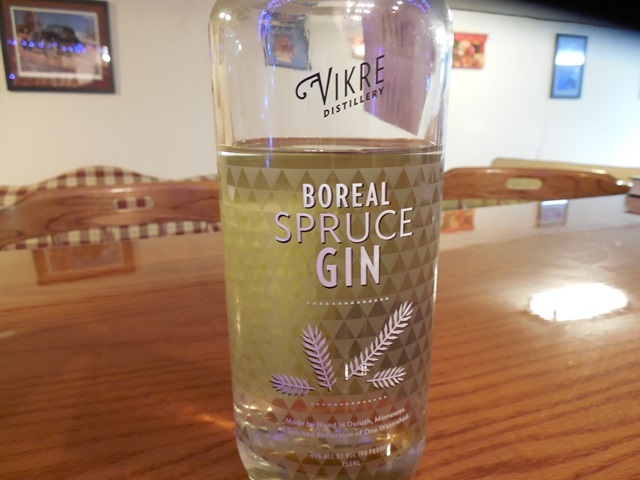 Boreal Spruce Gin is from Vikre Distillery in Duluth Minnesota. Boreal refers to the northern forest where they harvest some of the botanical for this gin. When I first saw this gin, I had to try it. It reminded me of my brother, Alex’s love of spruce tip beer. Just like Alex, Vikre harvests light green spruce tips and adds them to their gin. Gin is a clear, distilled spirit that is be made with juniper berries and other botanicals. Caitlin from Vikre told me that they taste the tips from each tree to ensure the tips are sweet. 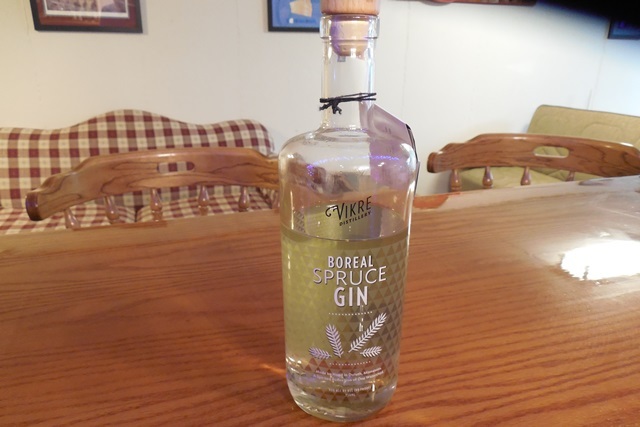 They only use the best tasting tips in their boreal spruce gin. It must be worth the effort because this gin is very good. 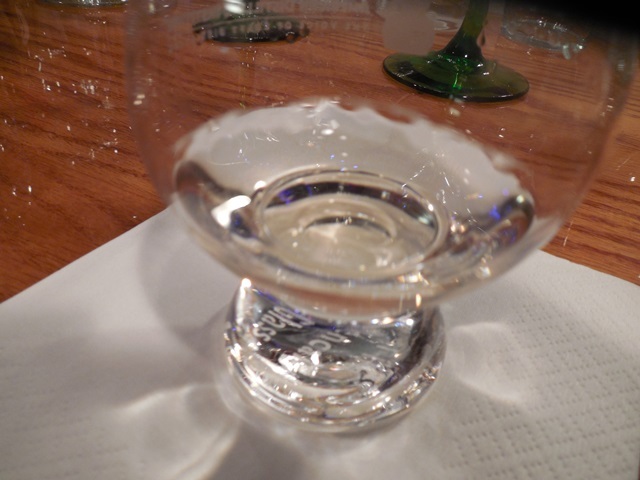 The gin is clear and devoid of any color with some body. The smell of juniper is a sweet pine, like a freshly cut Christmas tree. There is no burn at the start or end of the first drink. That was not expected, because it is 90 proof or 45 ABV. On the first drink, it coats the entire mouth with a smooth, piney flavor that is not overpowering. This is not anything like drinking turpentine, even though I can’t says I know what that would be like. This is a very pleasant tasting gin. 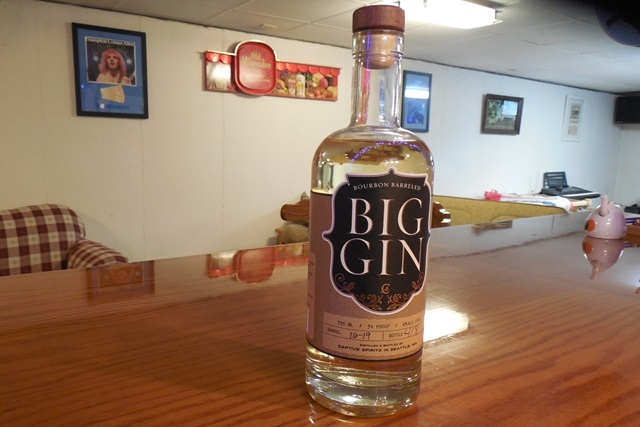 I wonder if you could sip this gin over ice and enjoy the flavor and body with its smoothness. This gin definitely would make a great gin martini. The chill from the ice cube brought out even more of the spruce tip flavor. 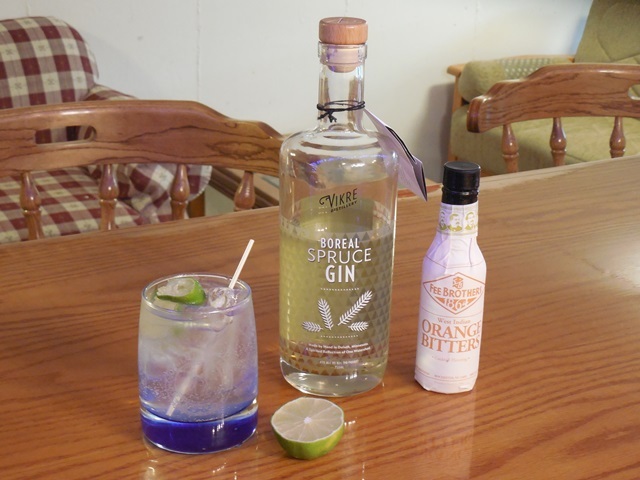 If you love spruce tip beer or gin, then you enjoy this gin and it should be part of your basic bar stock. 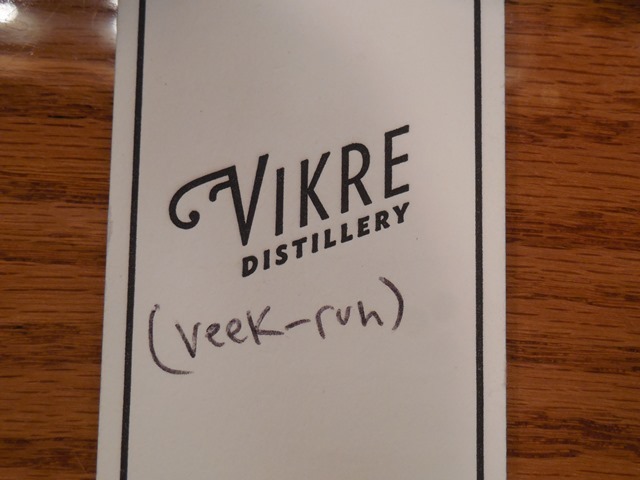 When I first tried this gin, the people at Vikre gave me lessons on how to pronounce the name, which wasn’t that hard. They even wrote it out on their business card for me. Here is your first lesson: “veek-ruh”. If you enjoy gin, there is no better drink than a Gin and Tonic. A couple of weeks ago, I read that even people who do not like gin generally enjoy Gin and Tonic. The two flavors compliment each other at a molecular level. On a hot day, this is definitely a nice drink. Fill an old fashioned glass with ice. Add gin and tonic and mix well. Add orange bitters and squeeze limes over glass and drop in. 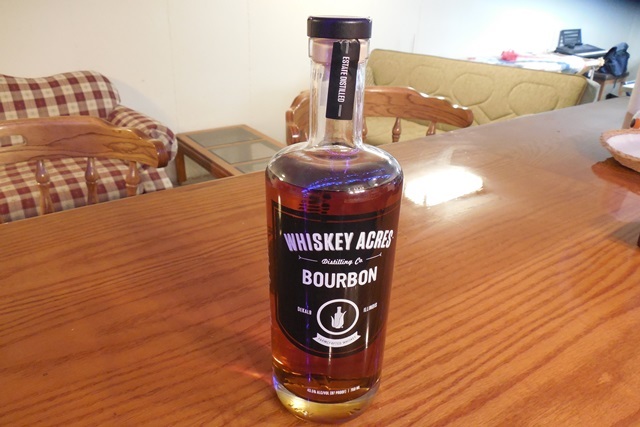 This week’s review is Whiskey Acres Distilling Co. Bourbon. 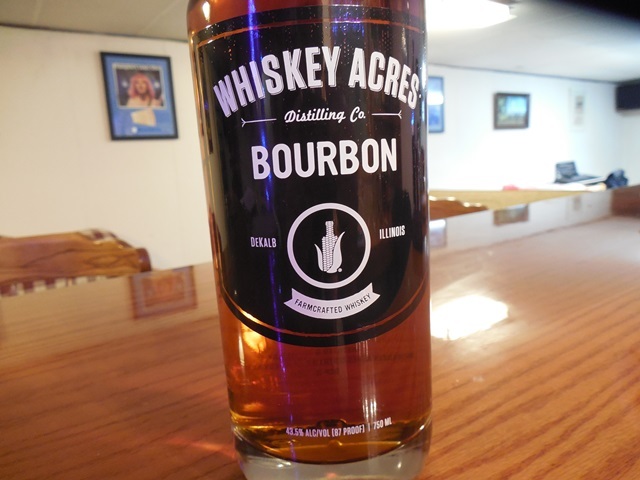 Last Saturday, June 4, Whiskey Acres released their Bourbon. Since they are close by in DeKalb IL, Joy and I decided to attend their Bourbon Release Party. The release party was very successful. I also got to meet Nick, who is a customer of Whiskey Resources. They always wanted to do Bourbon, so they have been making it for the last two years. To keep the lights on, they have sold Vodka made from corn, which is very popular. 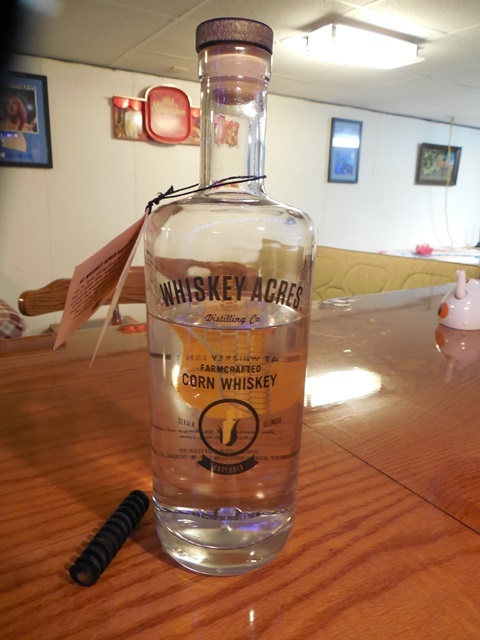 Whiskey Acres also sold an unaged Corn Whiskey. They gave the buyer a small chard oak stave so you can age it at home. 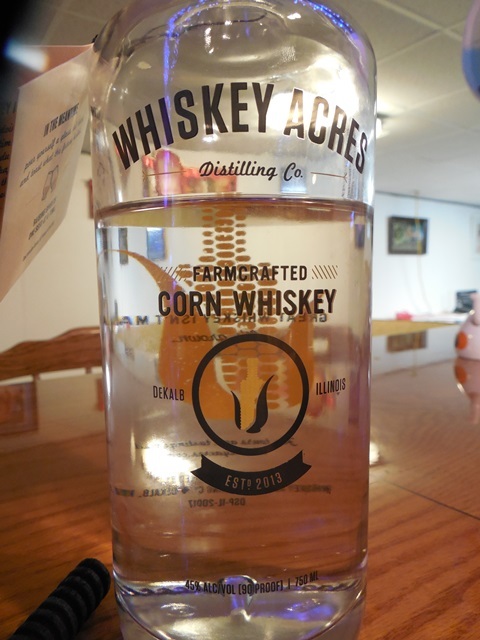 The Corn Whiskey is also very tasty and I will review in the near future. The color is a deep amber color and clings to the tasting glass very nicely. Being only two years old, I thought it would be lighter. The printed on glass bottles are nice with cork stoppers. I like their motto, “From Seed to Spirit”. Its appearance is everything you would want in Bourbon. The barrel warehouse is a repurposed quonset hut that has served as a corn bin at one time. This is a wheat Bourbon, so it is not as spicy as is normal for a wheat Bourbon. The smell is very nice. I find it hard to believe this is only aged for two years. That quonset hut must contain magic to produce this quality of a Bourbon in such a short time. The wood, vanilla, and nutmeg come across very nice. There is also a faint smell of corn. The distillery is on a working farm where they grow their own corn. They keep the best corn to make their Bourbon and sell the rest to other distillers. Only the best grain goes into the mash. The excellent quality corn makes the smell so nice. The taste is smooth from the front to the back. There is a little alcohol bite, but not much. It is bottled at 87 Proof or 48.5 ABV. 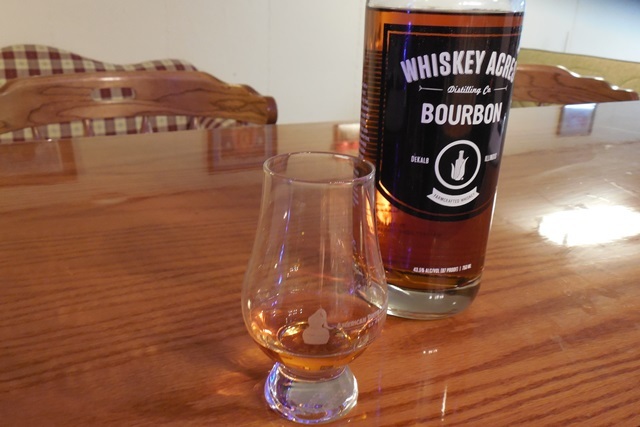 The spice is mellow and the grains are soft just as you would expect from a wheat Bourbon. I really like the smell from the plentiful vanilla and orange, but it is not harsh. This is the best inhouse craft Bourbon that I have tasted. Again, it is only two years old. So this proves you can’t judge Bourbon by its age. A splash of water does open this bourbon very nicely and just enhances its wonderful taste. When tasting, it is hard not to stop and give it another smell. The smell is simple grain with the spices of wood. But like good blues, it sounds simple yet so hard to play. The wonderful smell is simple, but yet it is a perfect smelling Bourbon. 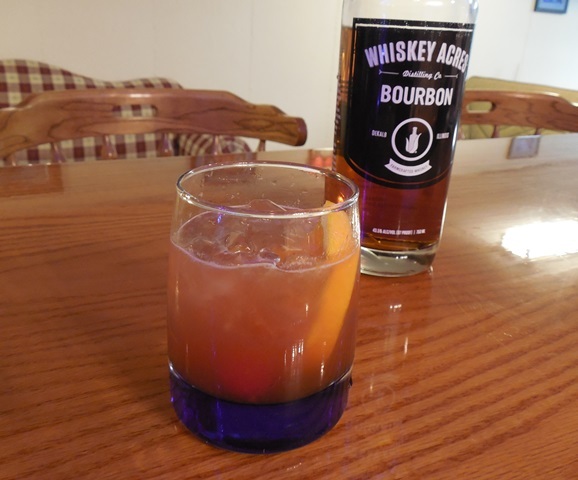 I made an Old Fashion, which is the drink I had during the Bourbon Release Party. Muddle the sugar, bitters, orange, and cherry together. Add bourbon and strain into a ice filled old fashion glass. Add an orange slice and cherry. 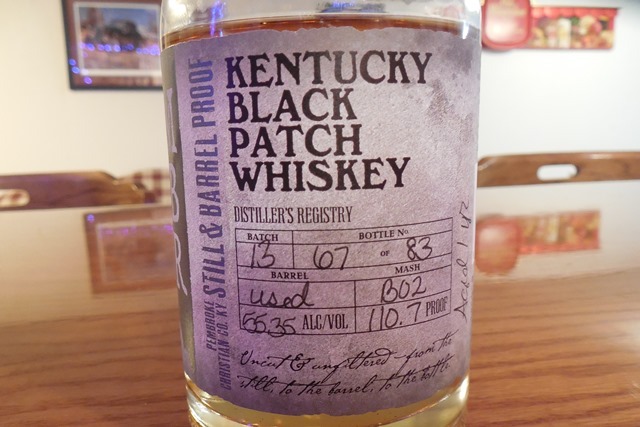 When I attended Distiller’s Boot Camp at MB Roland in Pembroke KY we where introduced to Black Patch Whiskey. 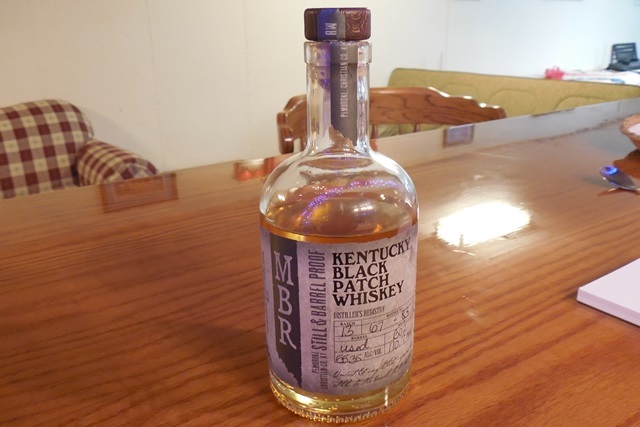 This is a single barrel whiskey bottled at barrel strength. It was in the barrel for a year and is an interesting whiskey. In the interest of full disclosure MB Roland is a customer of mine. Since is was aged in an used barrel this is not a bourbon. The smoke corn in the mash bill gives it a Scotch Whisky like character. Since it is not made from Single Malt nor in Scotland is is not Scotch. But that should not stop you from trying this whiskey. As you can see the color is light amber color. The whiskey does cling to the glass a little bit indicating that it does have some body. The bottle has a cork stopper and nice simple shape. This is the small 375 ml bottle. This size is nice because you don’t have to make the same investment as a 750 ml. This whiskey is bottled at 110.7 Proof (55.35 ABV). It is fun to read the label. The smoke smell if very strong. Talking to Paul the distiller owner at MB Roland they used 25% smoke corn in this mash bill. They smoke the corn themselves. The smell is a very good indication of the taste. Very smokey like Barbecue. The high alcohol gives the finish a good bite. In the background there is a little sweetness from the corn and just a hit of wood. The year in the barrel did add something but not much. The ice did bring down the alcoholic bite. It also helped mellow out the smoke a little. The people at the distillery say to drink this strait and it did taste better strait. It would be nice in a tumbler taking small sips. It would also be fun to to shots with the guys. 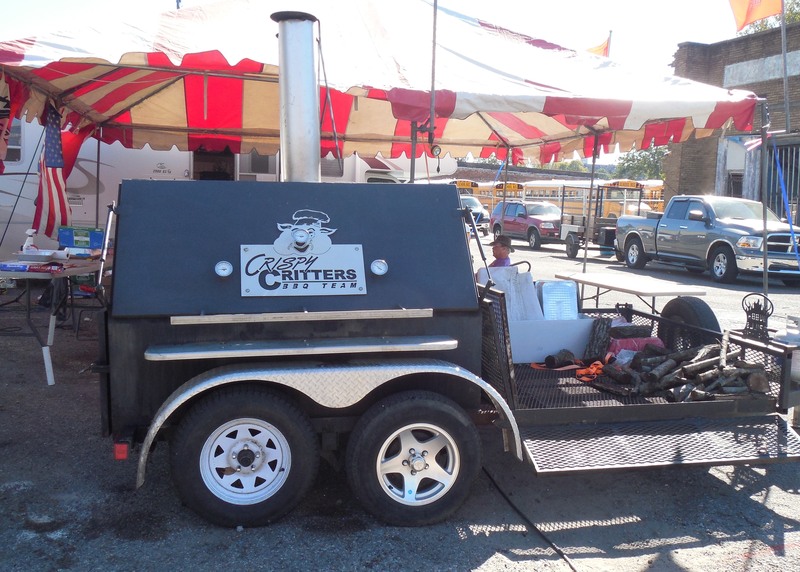 The would be great to take to a Barbecue. The fun thing about craft spirits is they distillers are experimenting with new ideas. To smoke corn and make whiskey with it is not something you will find everyday. I would not think of this like American Whiskey but like a Scottish Single Malt. That is about the peat smoked barley malt. This is about the hickory smoked corn because it is American. I have quite the collection of bourbons and other spirits at my bar. The plan is to taste each one and post about them to this bog every week. I hope people find this interesting. If you read this far thank you.